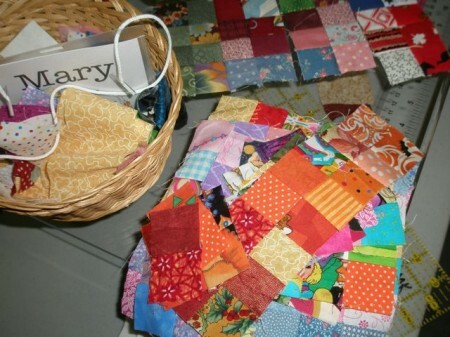 There were lots and lots of projects finished at our quilt retreat. 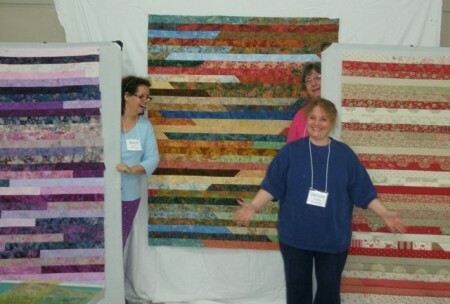 Each time one got finished, it got held up for a big, “TAH-DAH! 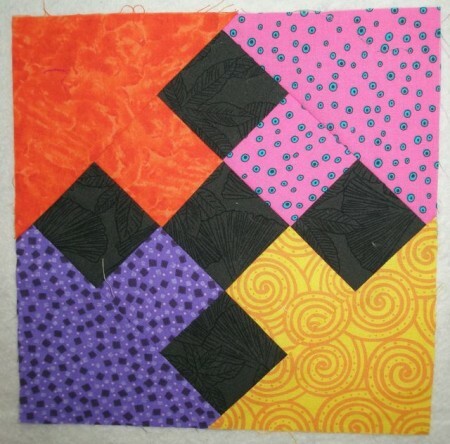 Isn’t this a great pattern to showcase a bold print! 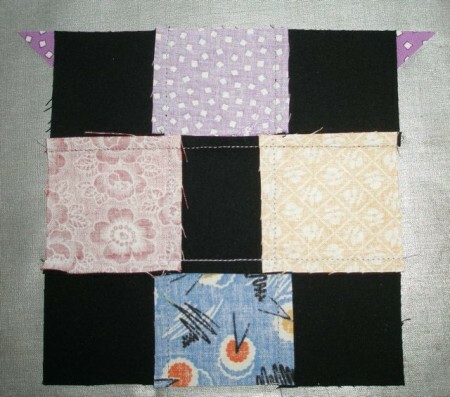 Several ladies made thread-catcher/pincushions for their work spaces. 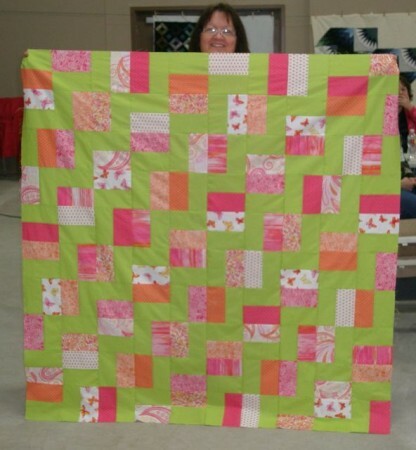 Joy is “pretty in pink.” And lime! 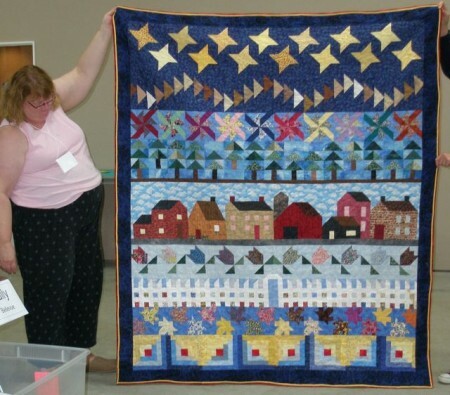 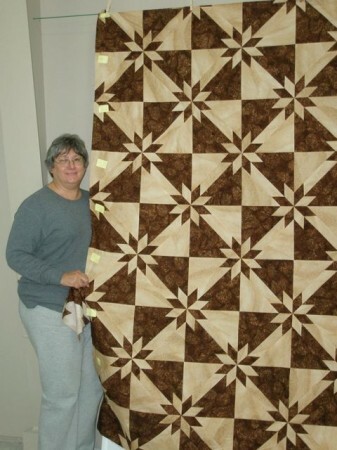 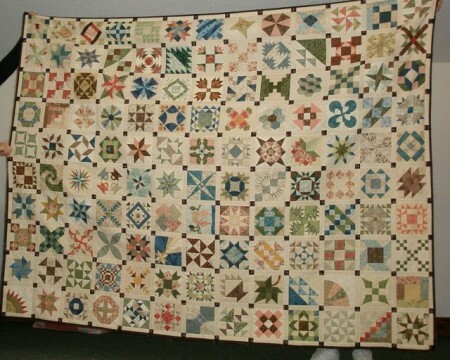 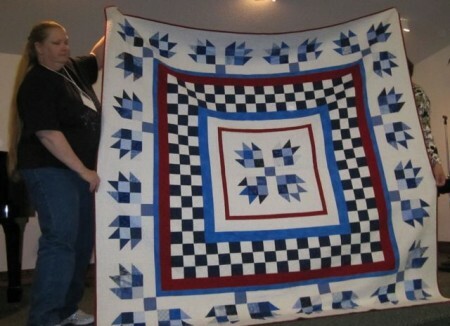 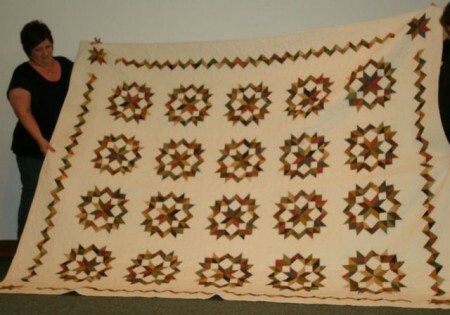 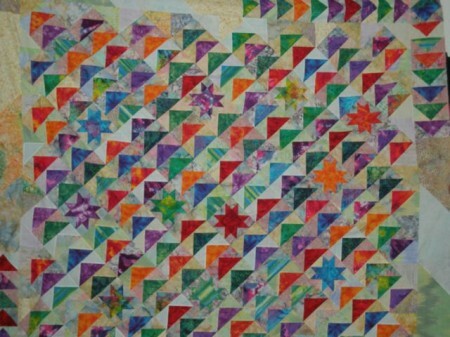 Several people were working on Hunter’s Star quilts. 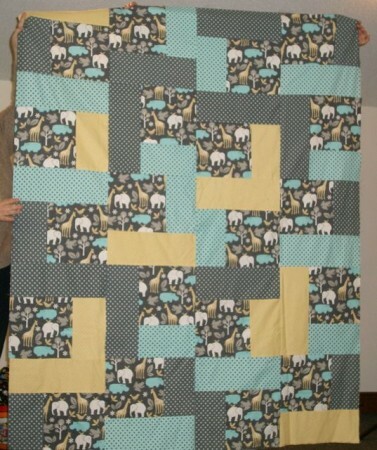 And while they may not have gotten finished…. 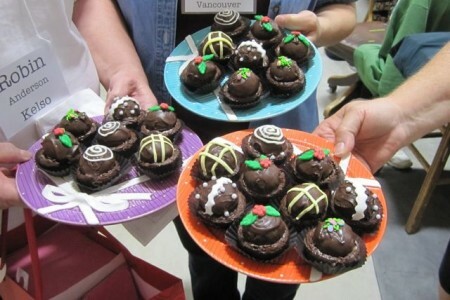 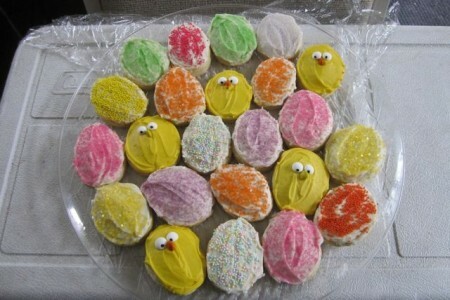 …I thought you might like to see them. 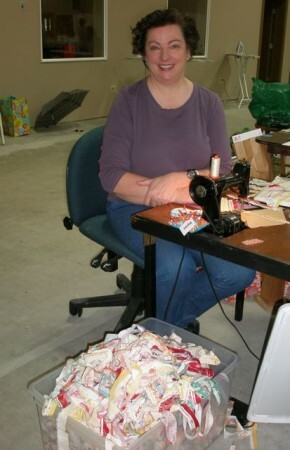 Sharon’s Off Center Bow Ties are striking. 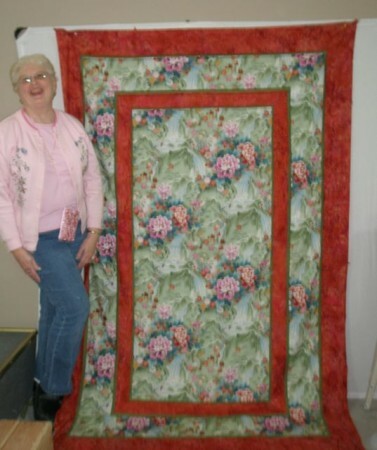 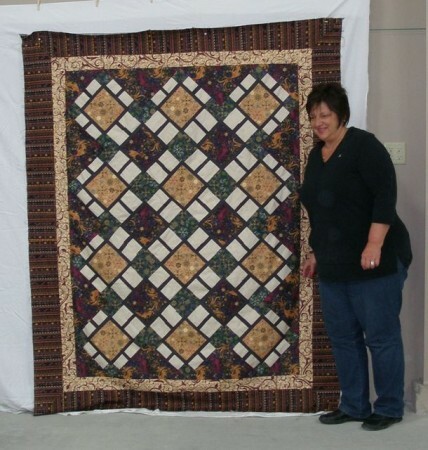 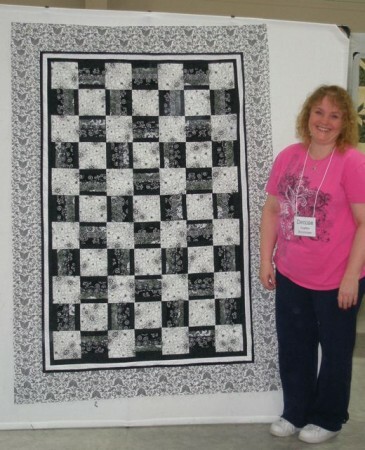 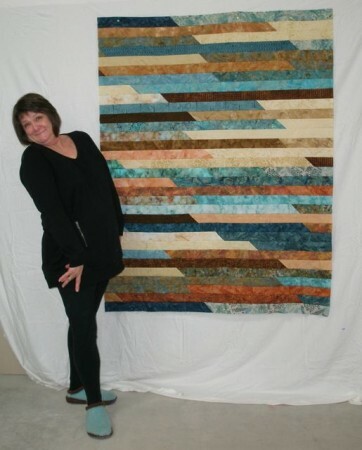 I asked Marsha to pose by her 6100 Quilt, and pose she did! 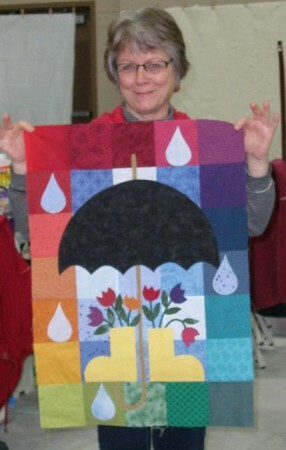 She’s done this before, me thinks! 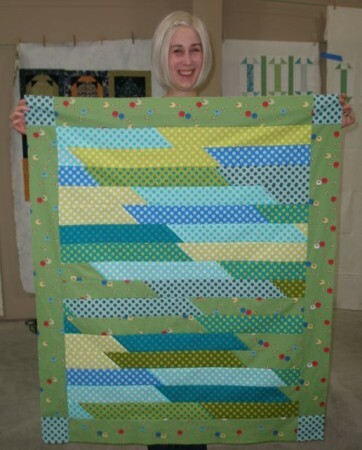 Sarah was making striking quilt with the Lil’ Twister tool. 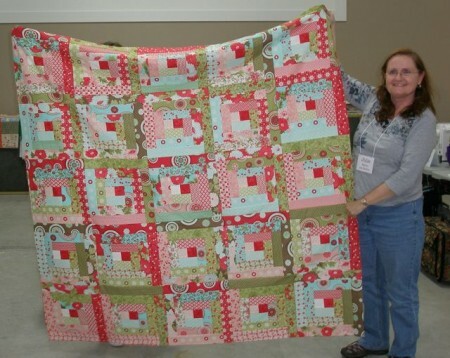 I think this bright beauty was Sherrie’s. 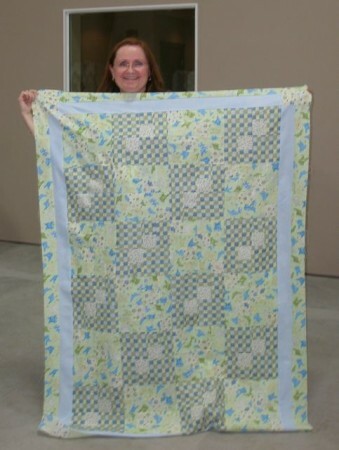 Chara brought back a quilt that she made at the last retreat–all quilted now and just waiting for binding. 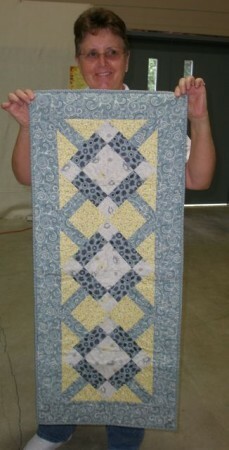 Connie sewed up this Double Delight quilt top for me. 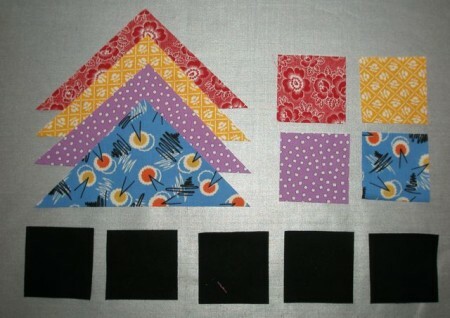 There are kits on my website! 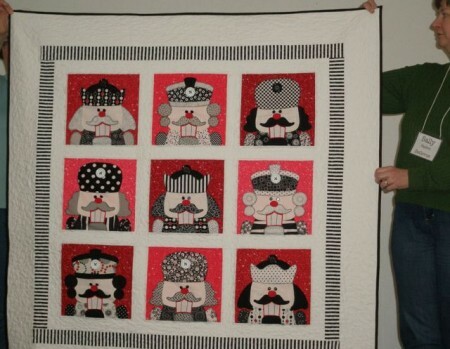 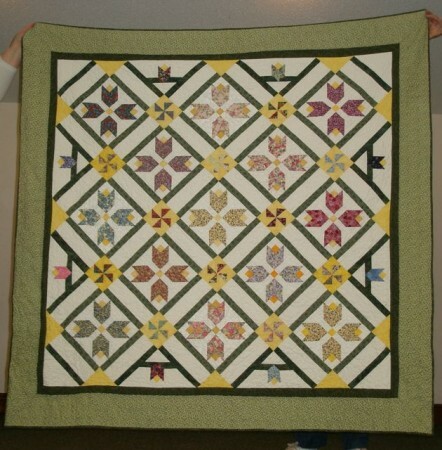 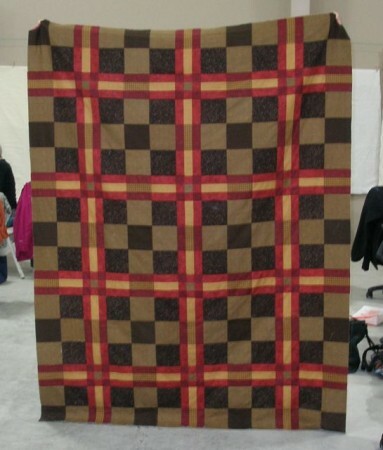 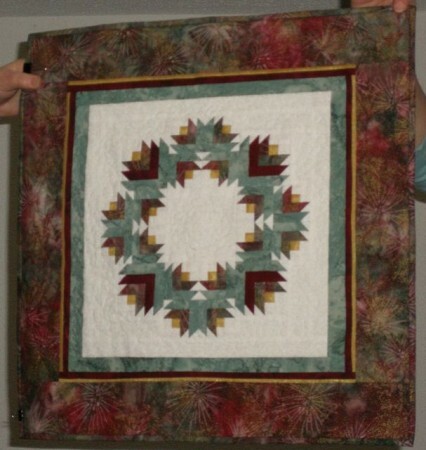 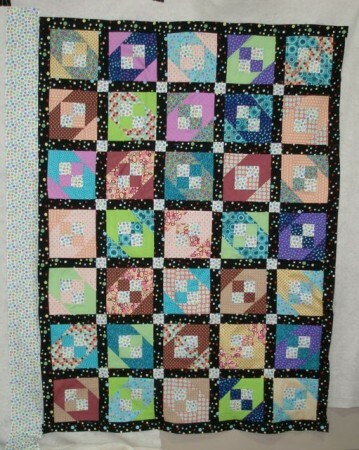 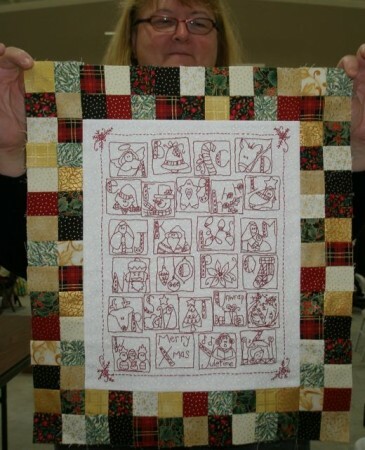 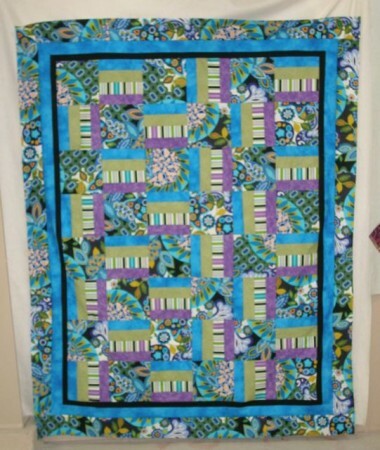 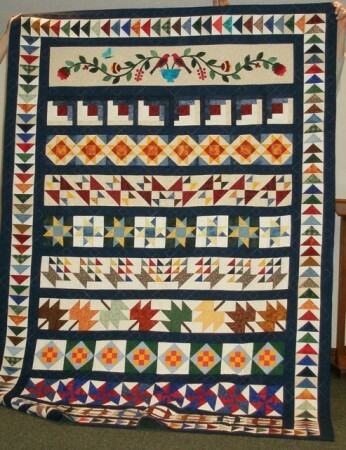 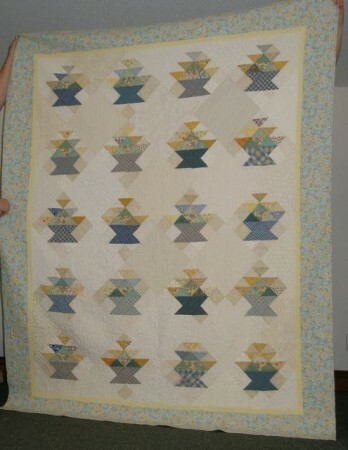 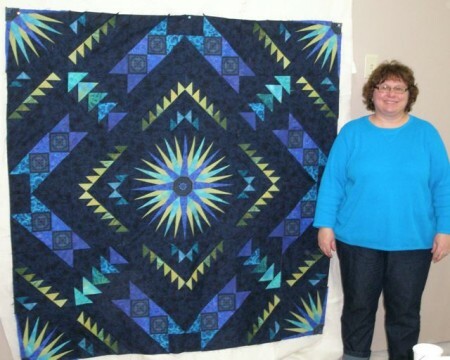 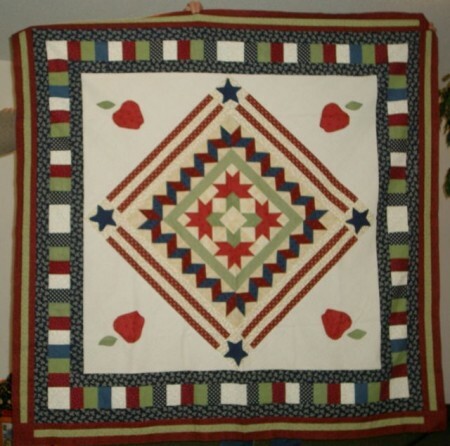 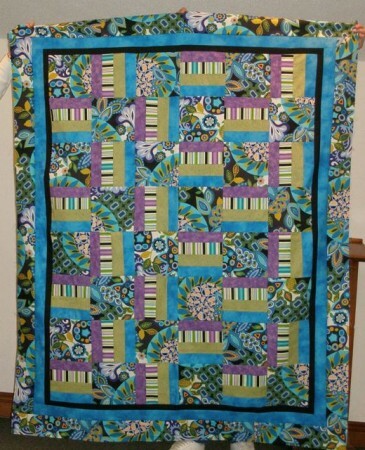 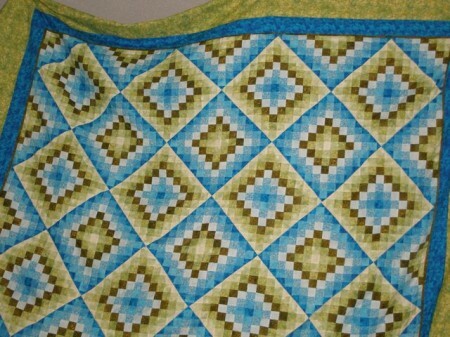 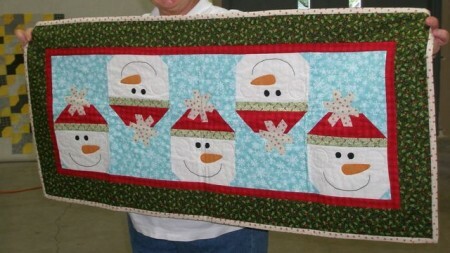 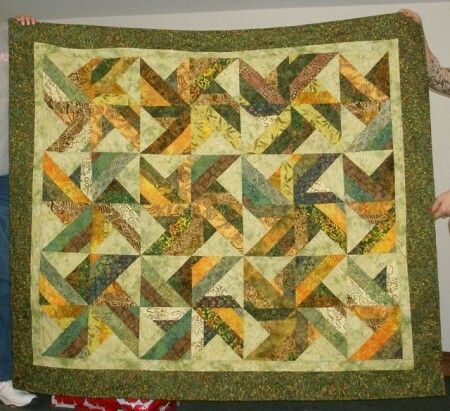 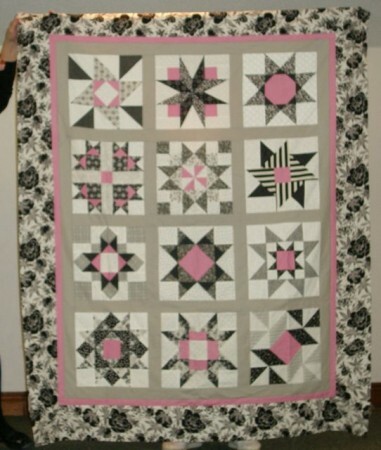 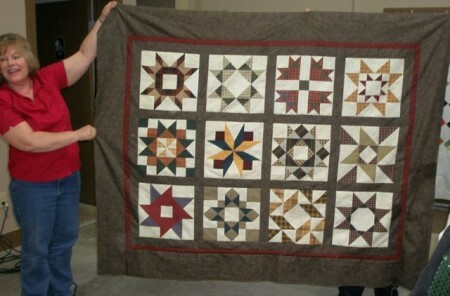 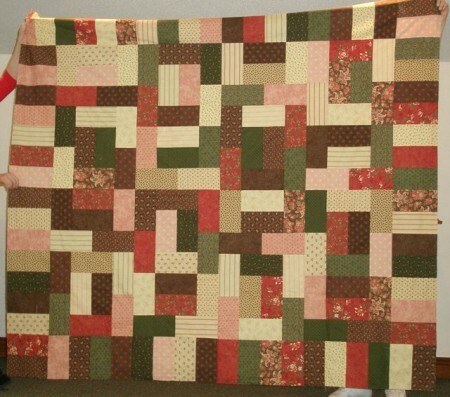 I love the shadow effect on this quilt by Sherrie. 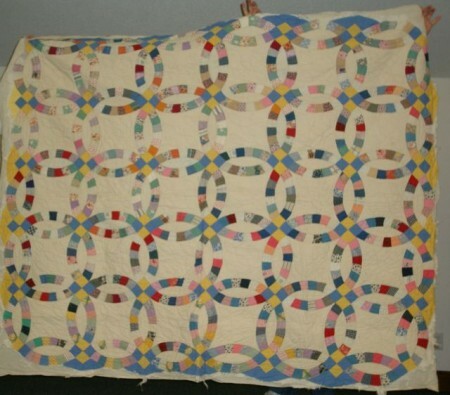 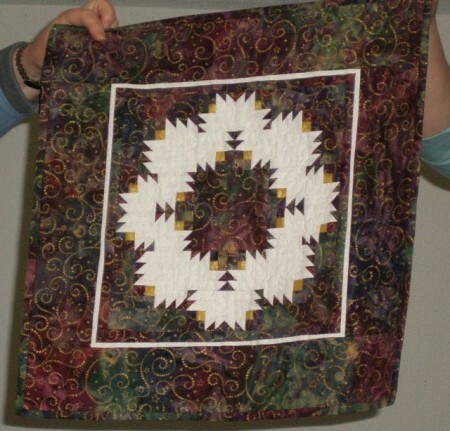 Chara was making a stack of circles for a Rob Peter to Pay Paul quilt. 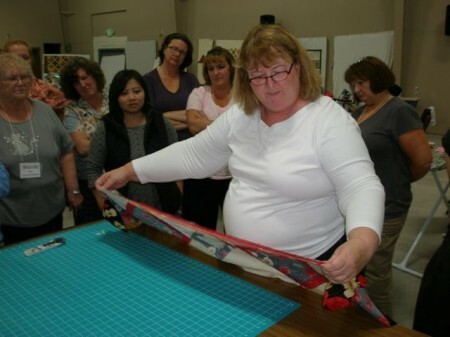 Stacey took this mystery class from me, hmm, a “few” years ago. 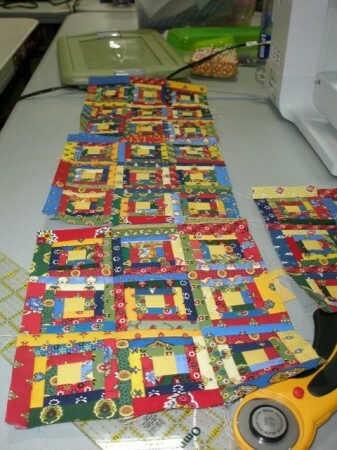 I was so glad to see it getting put together. 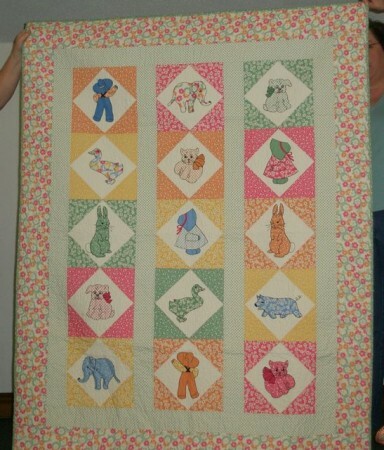 Julie stitched up this sweet quilt. 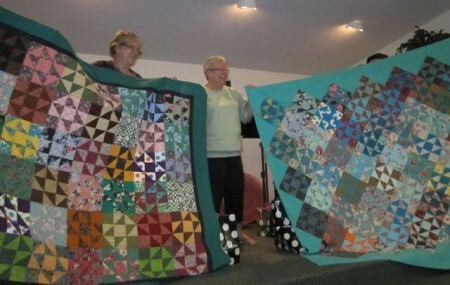 Mary, Penny and Denise also made 6100 Quilts! 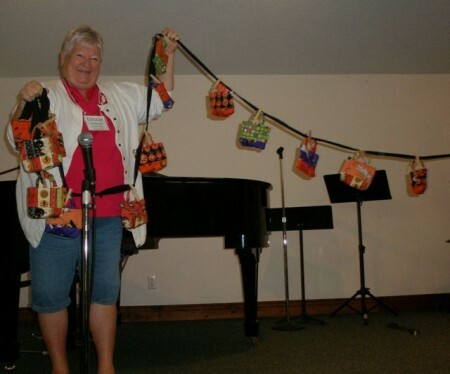 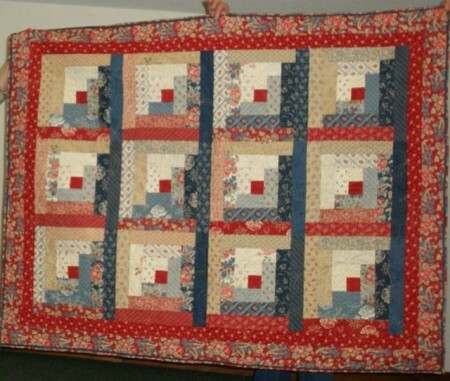 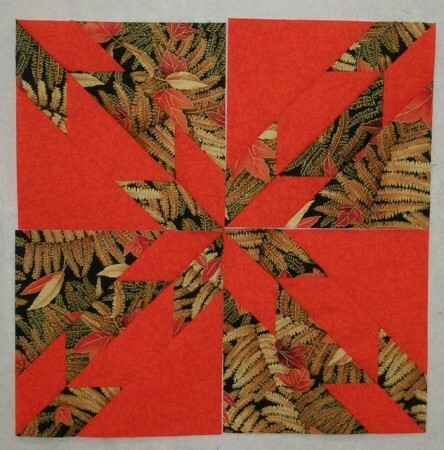 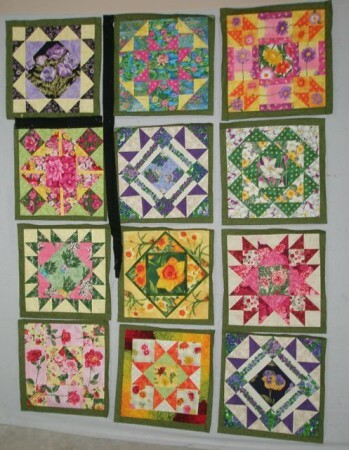 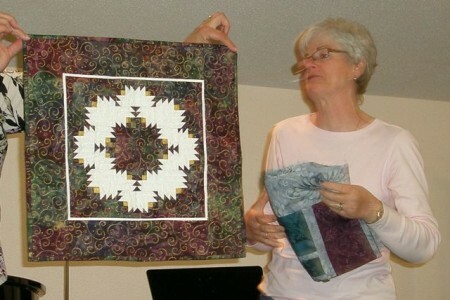 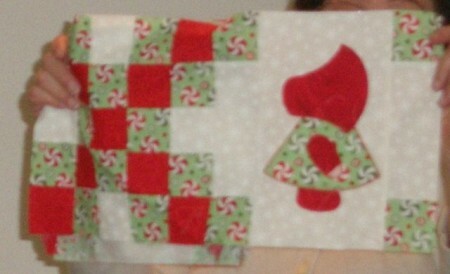 We did a Block Swap with the Crossroad to Jericho blocks, and Pat put hers together during the retreat! 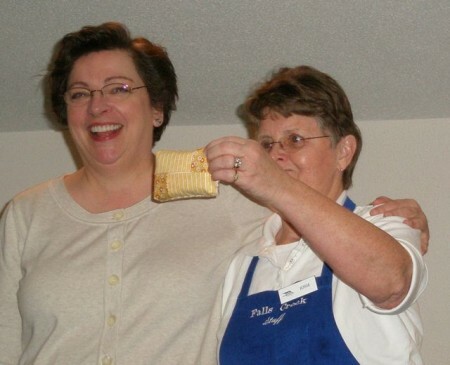 Way to go, Pat. 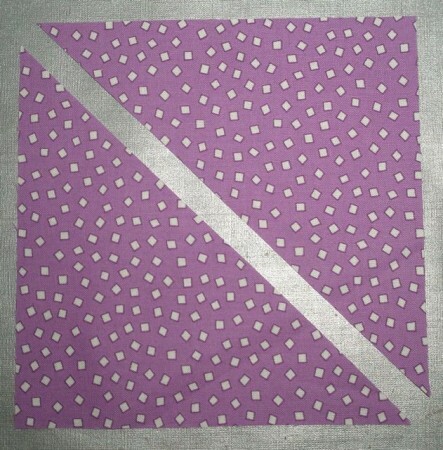 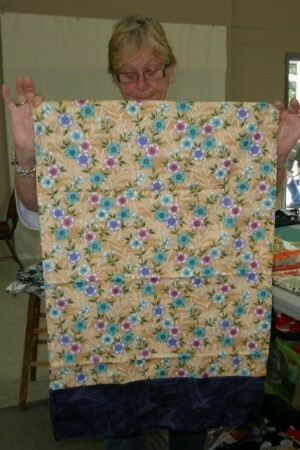 Barbara was ready to put the borders on her polka-dot quilt. 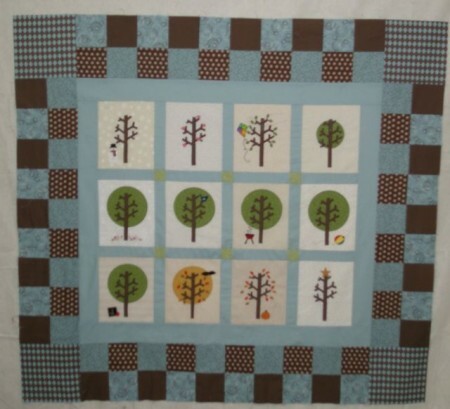 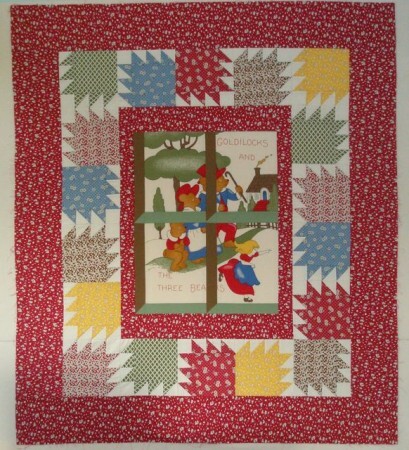 This is Anina’s own design, Geese in the Forest. 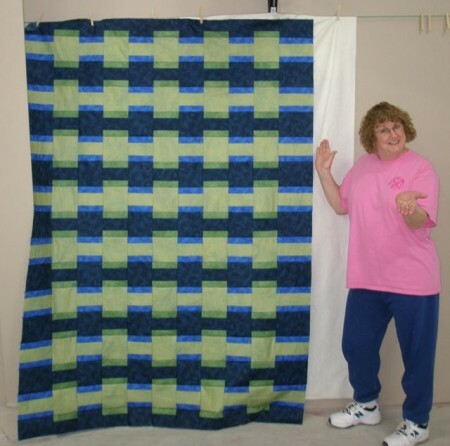 She sells the pattern on her website. 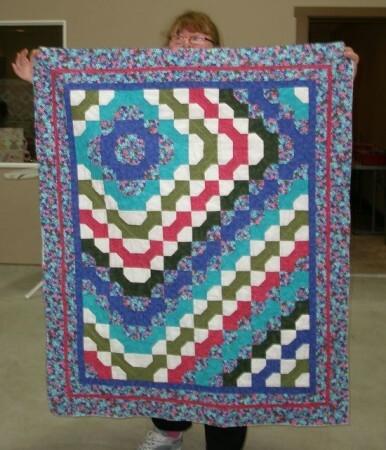 I think it’s stunning! 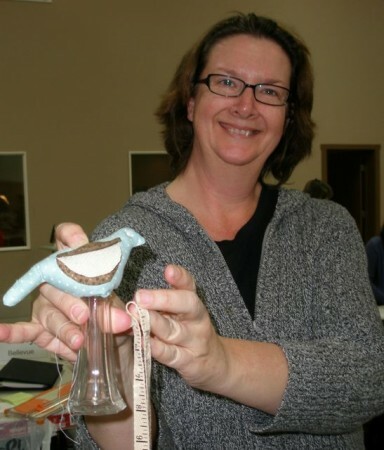 Karen J. was nearly finished with this charming bird pincushion. 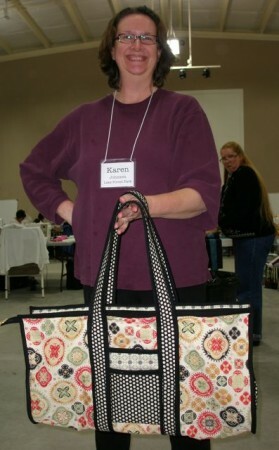 Kathy spent many hours on this fabulous beauty. 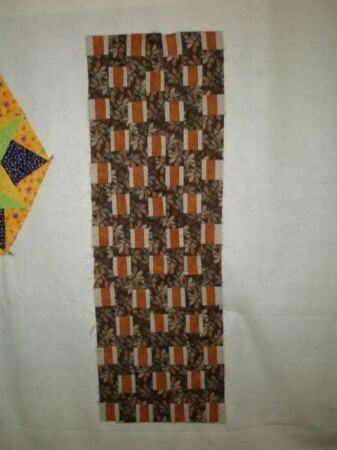 This is 1/4 of it. 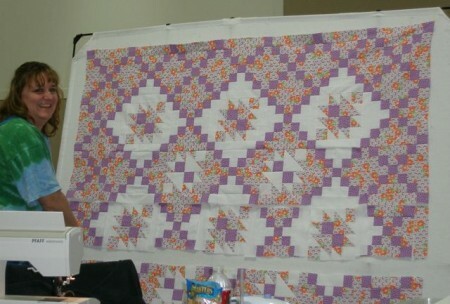 She’s getting there! 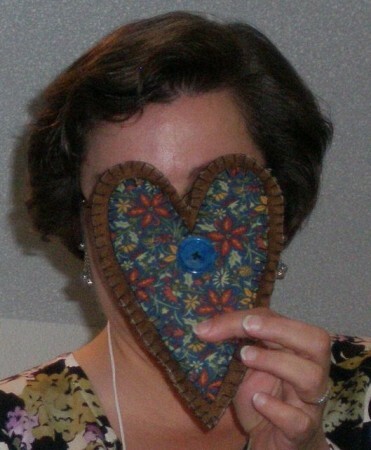 I have one more batch of photos from retreat to post, so check back! 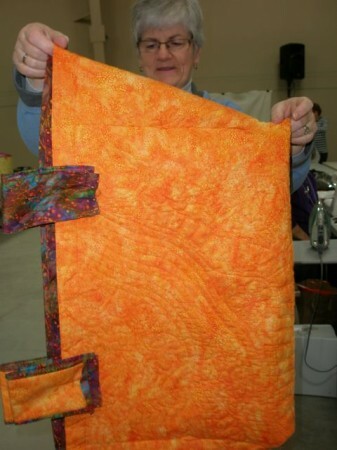 Pat P1 (We had three Becky P’s) made this great batik quilt. 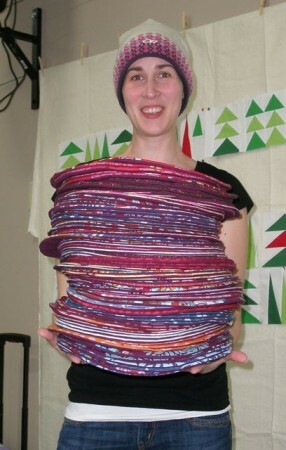 Every time I looked up, she was pressing strips. 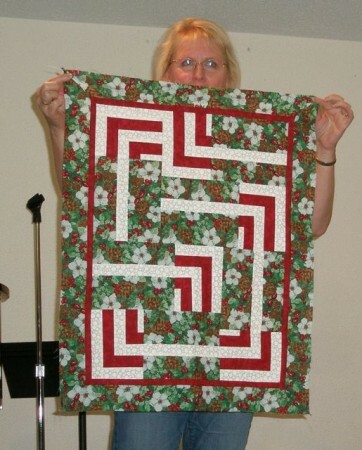 Now I know why! 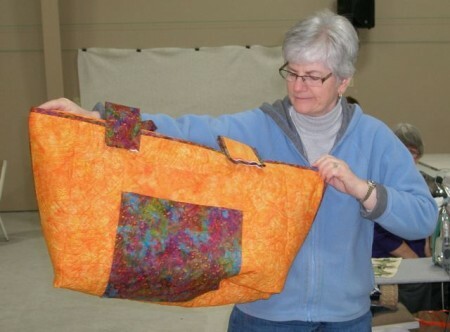 She brought this jacket she made for show-and-tell. 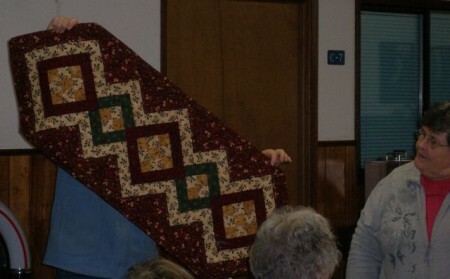 Her sister, Becky L, was working on this quilt at the last retreat. 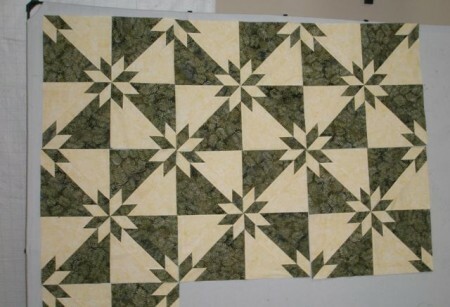 It’s so nice to get to see them finished. 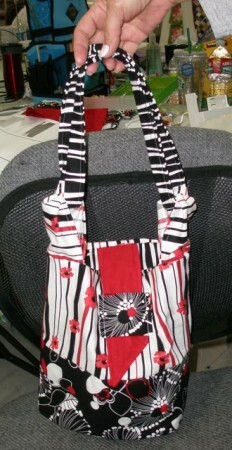 And look at the interesting back she has on it. 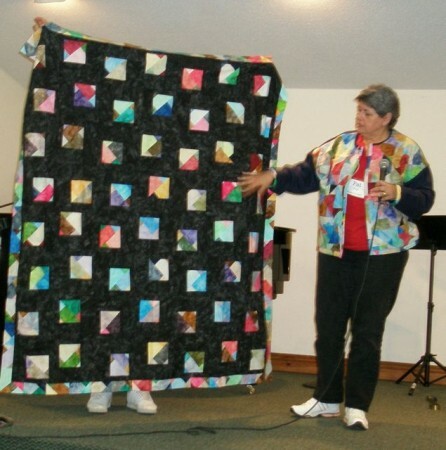 At retreat she made this quilt top. 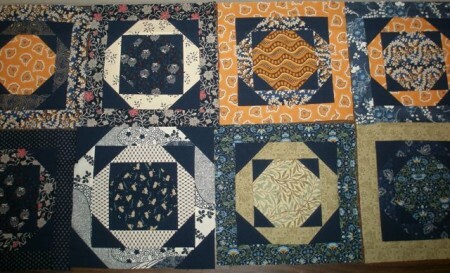 I love the bear tracks. 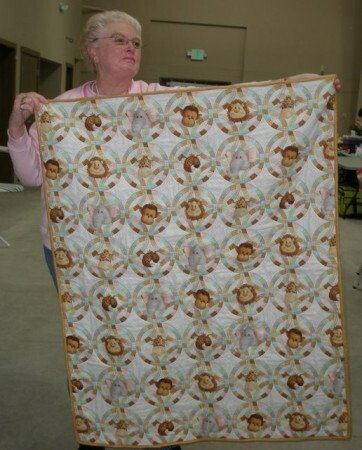 Once the border is on, she will applique a bear there! 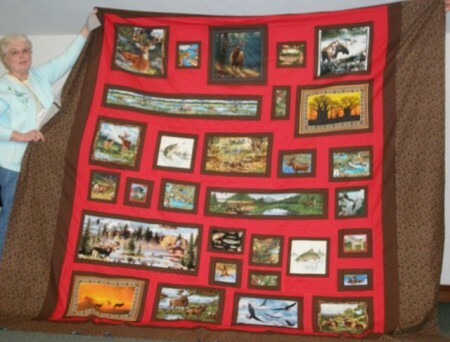 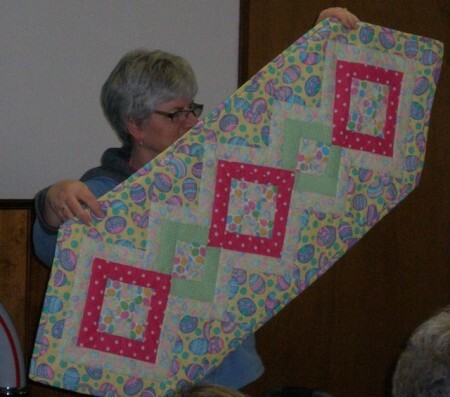 Sharon brought this row-by-row quilt for show-and-tell. 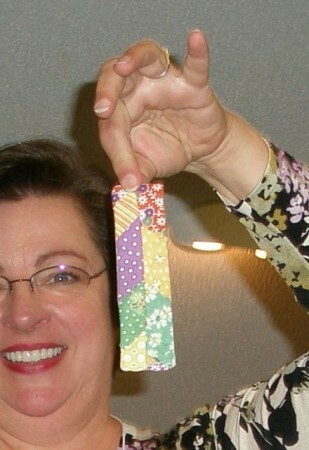 She knew about the Summer Bow Tie Challenge, so brought this to show, too. 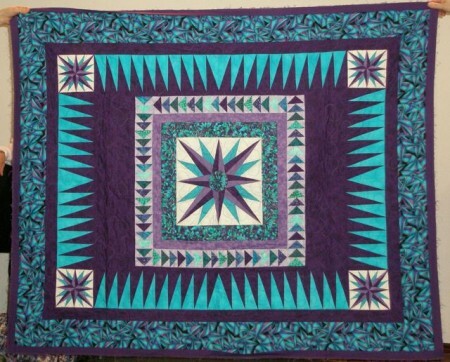 I love the asymmetrical setting. 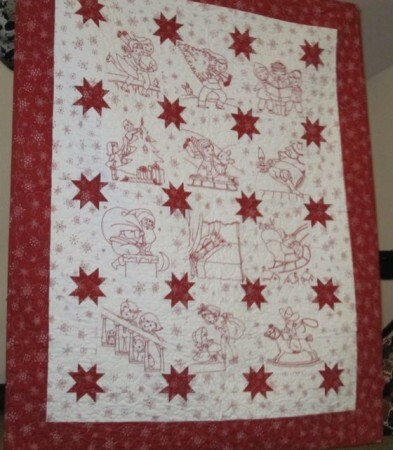 She also brought this adorable Christmas Redwork. 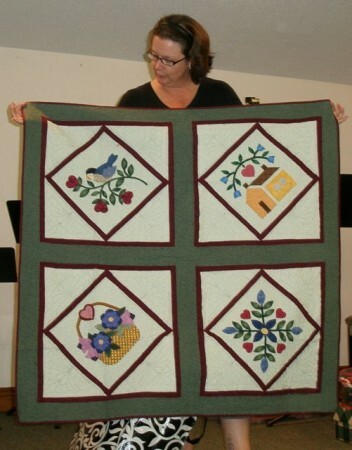 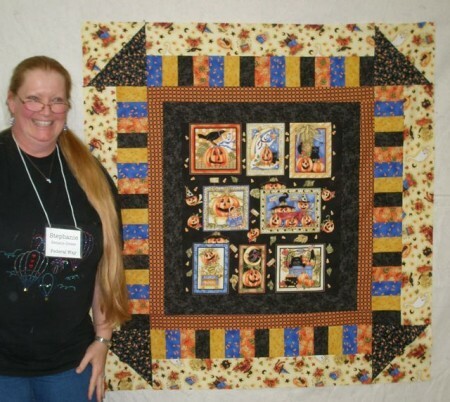 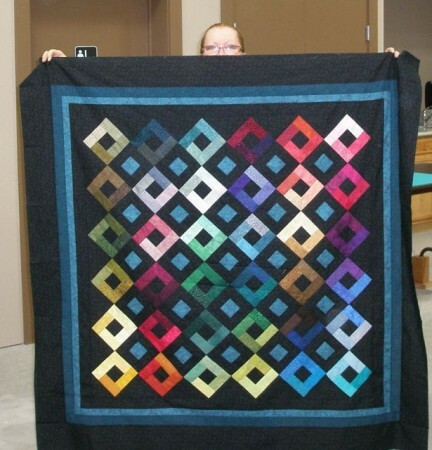 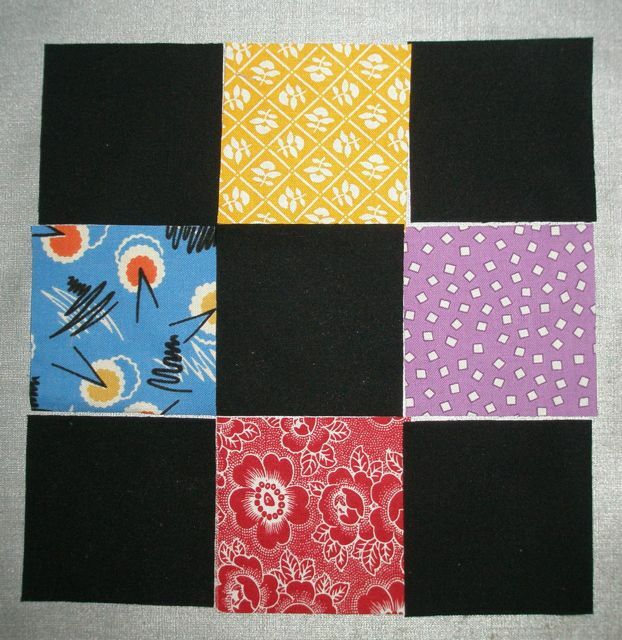 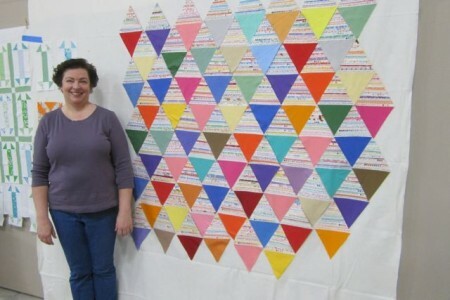 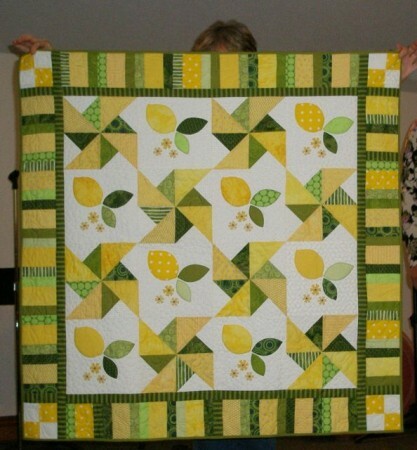 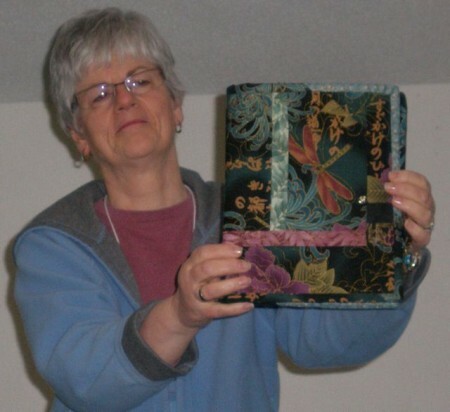 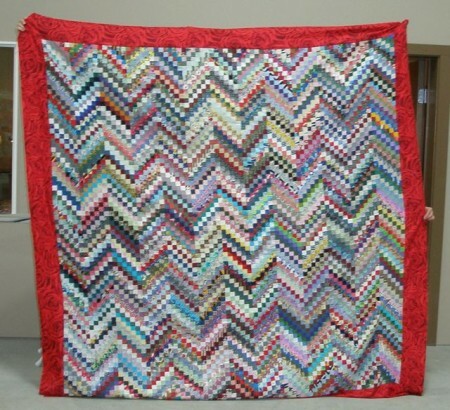 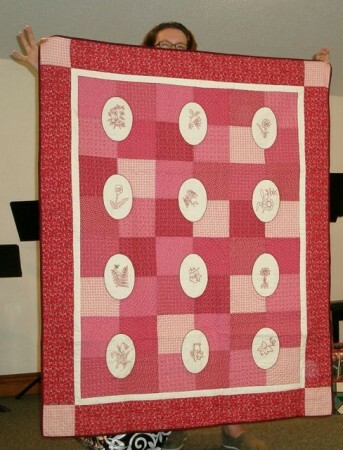 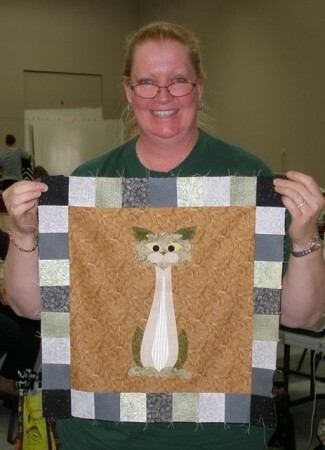 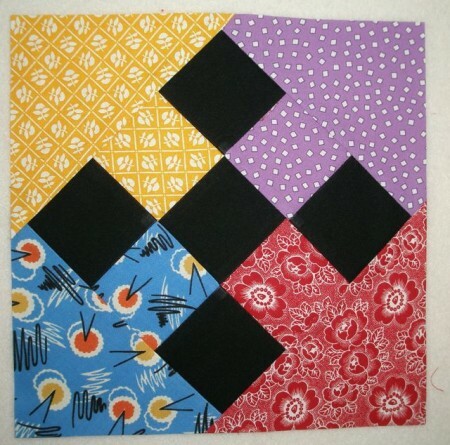 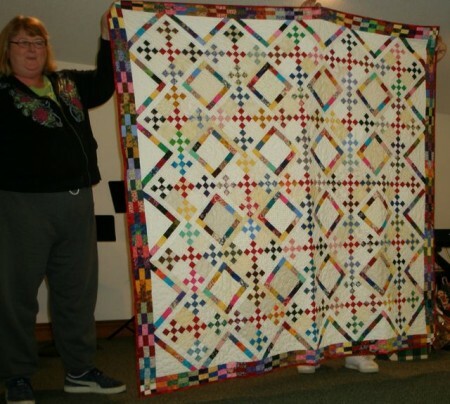 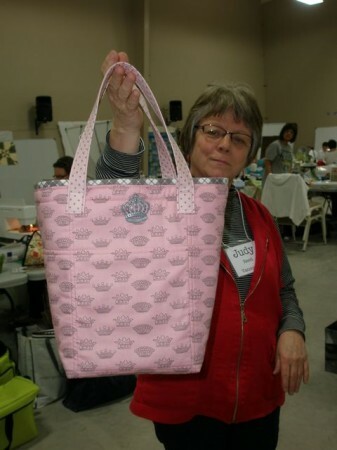 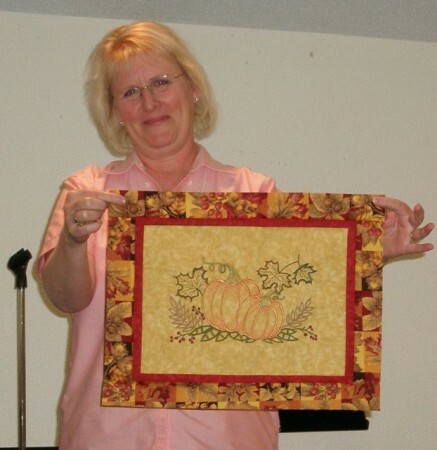 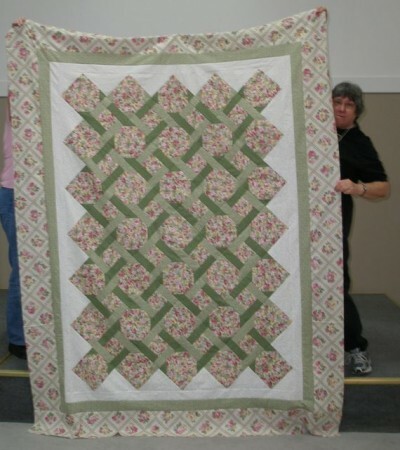 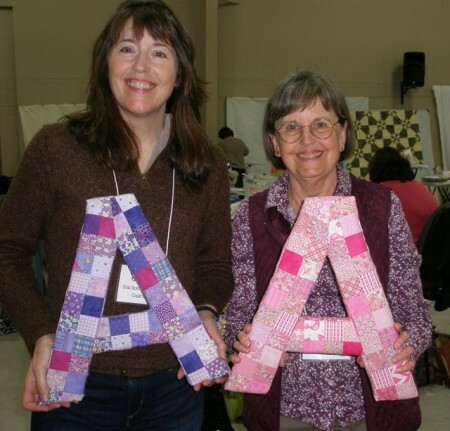 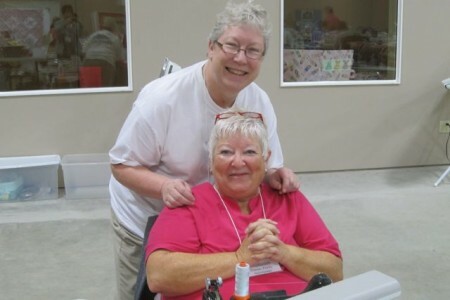 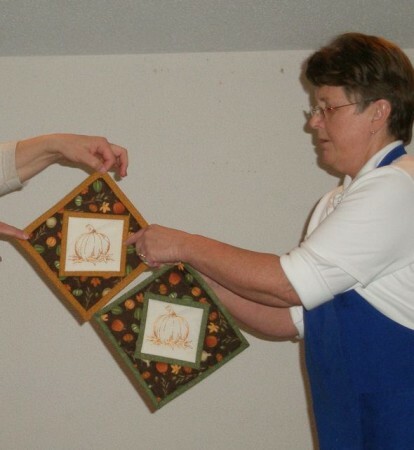 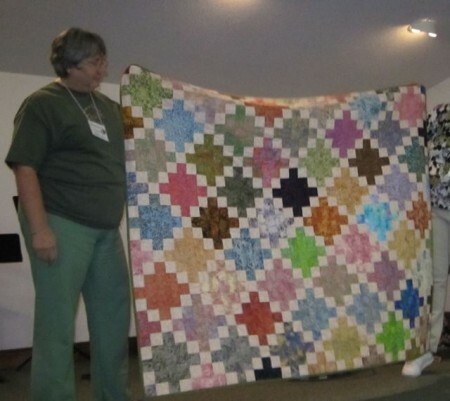 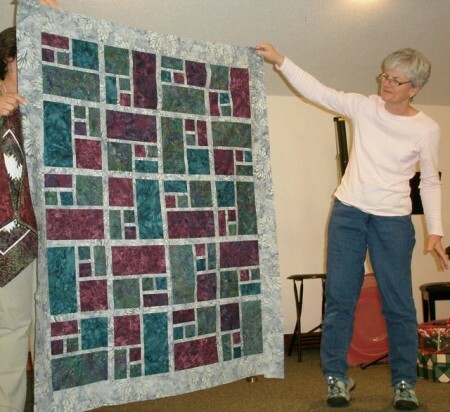 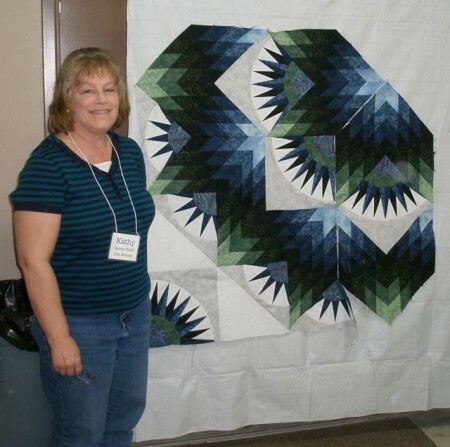 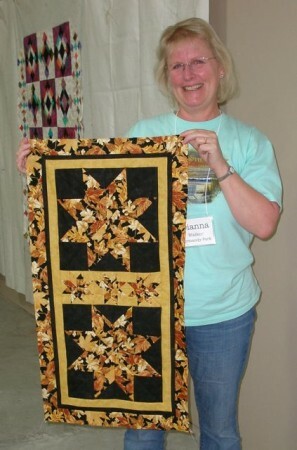 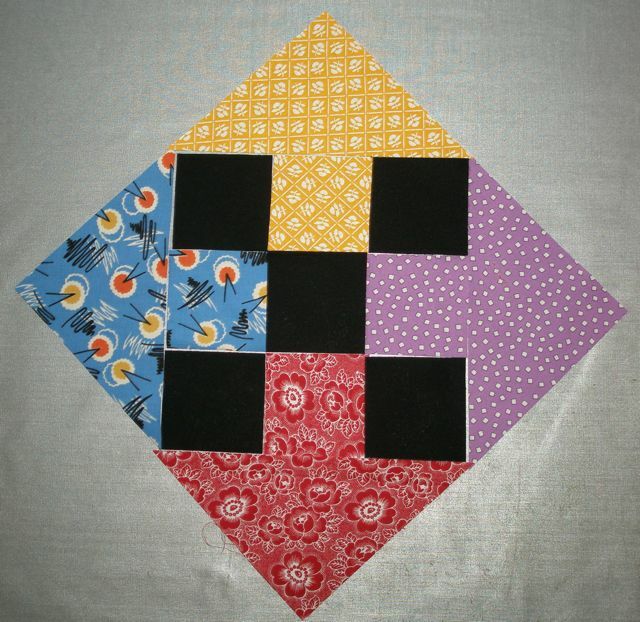 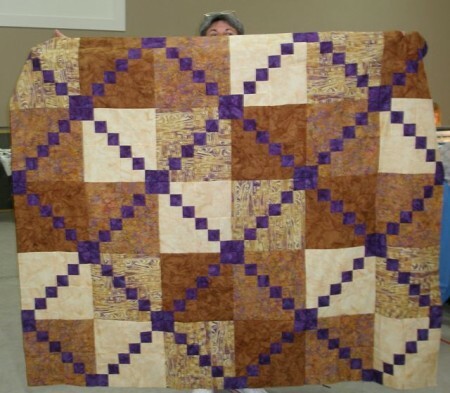 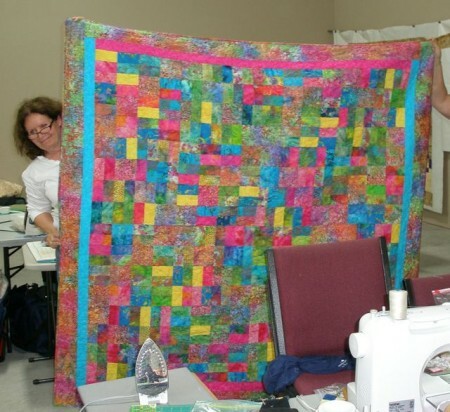 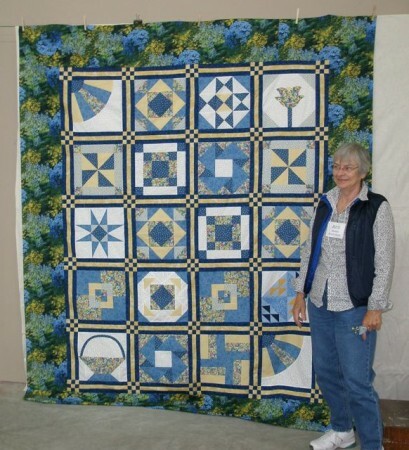 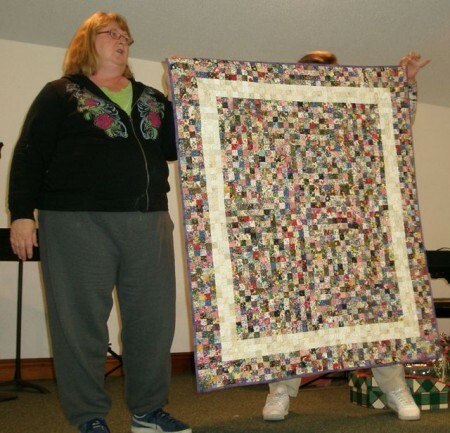 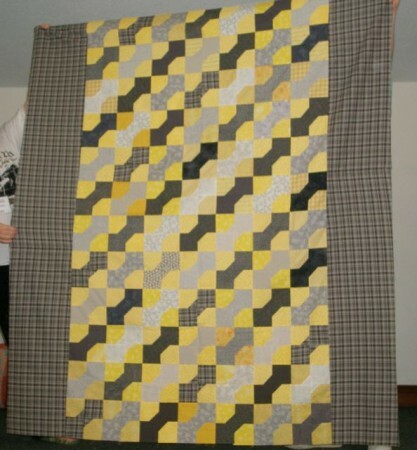 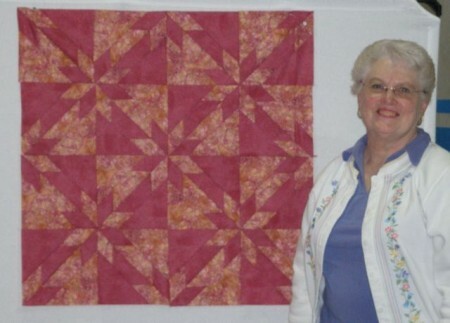 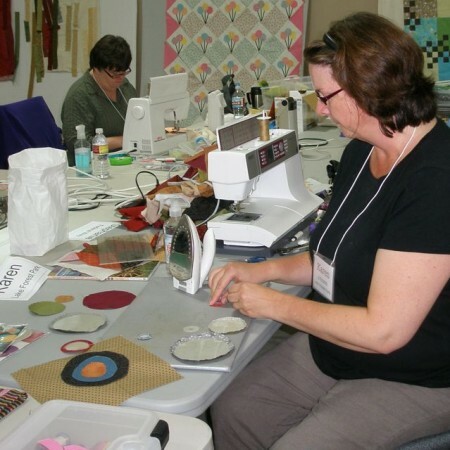 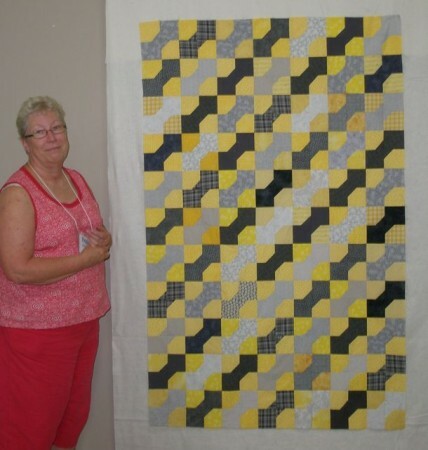 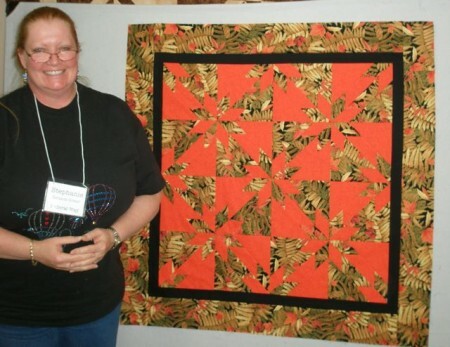 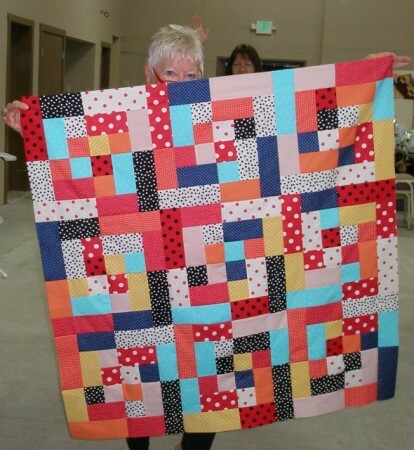 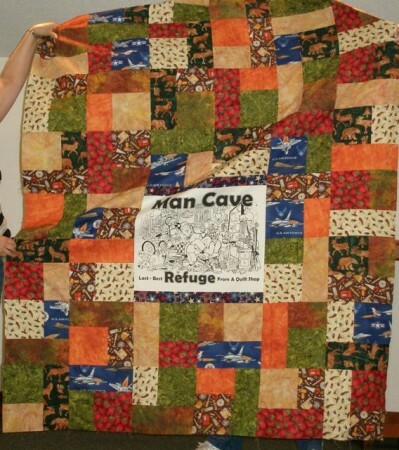 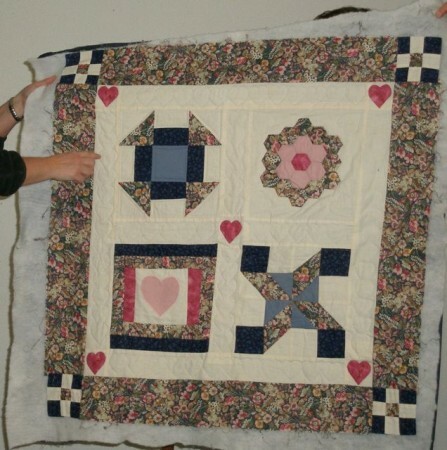 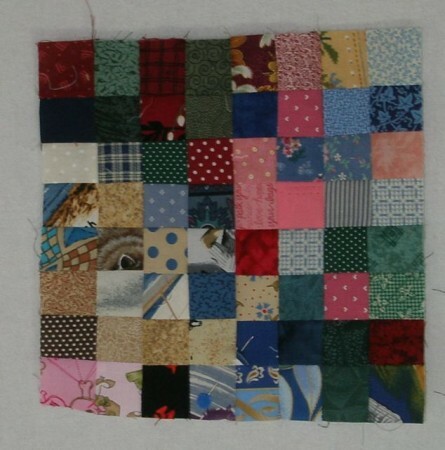 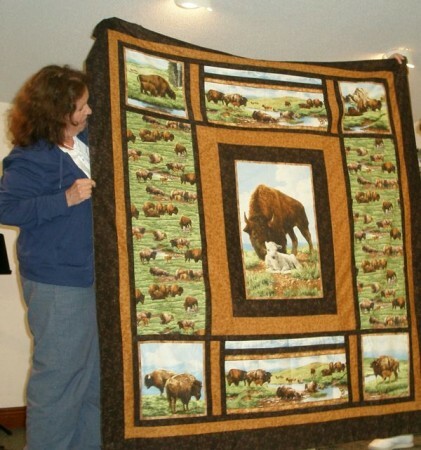 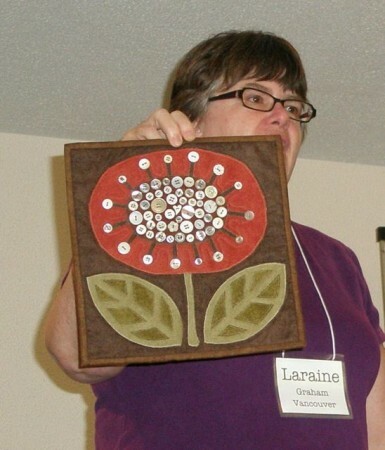 Robin is always challenging everyone to do 1″ square scrap quilts, so this was a perfect show-and-tell. 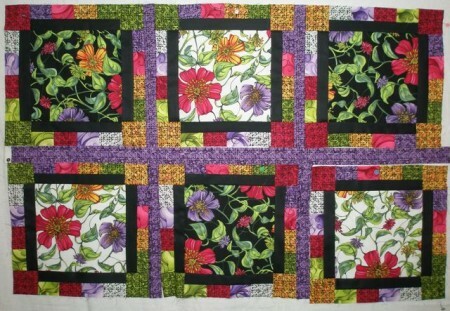 Every print, both the light and dark, are florals! 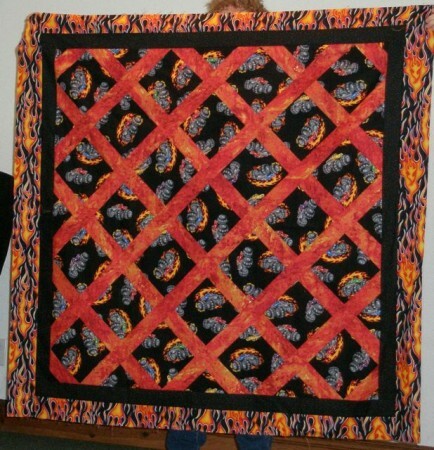 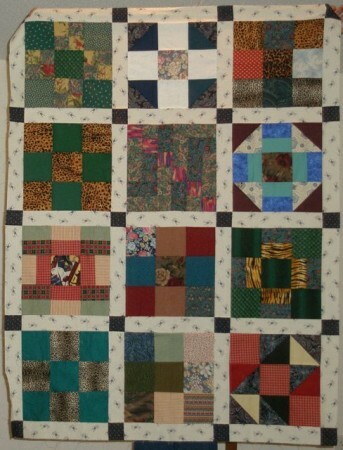 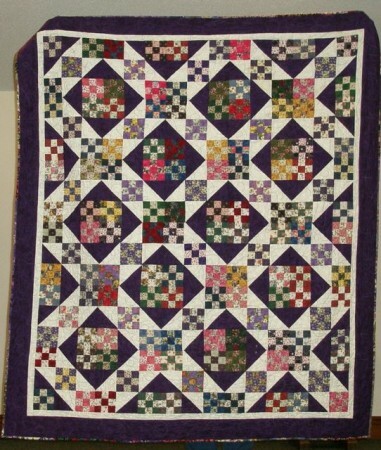 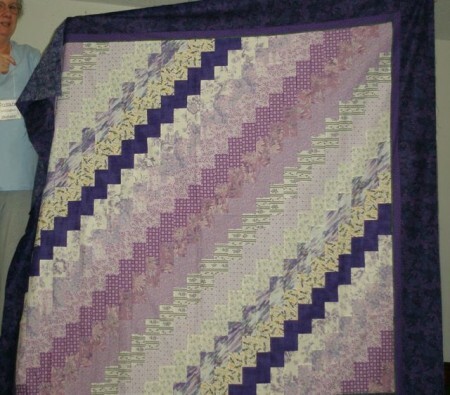 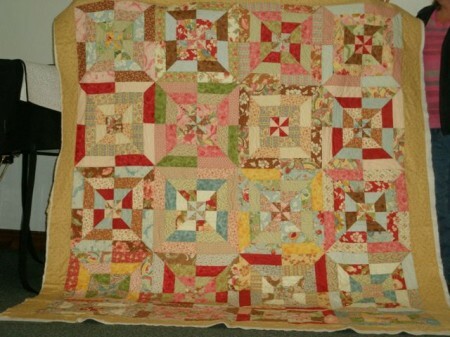 Another pretty quilt from Sharon. 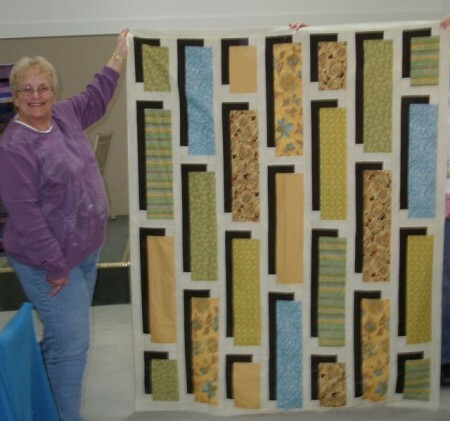 She did a great mitered border demonstration for us! 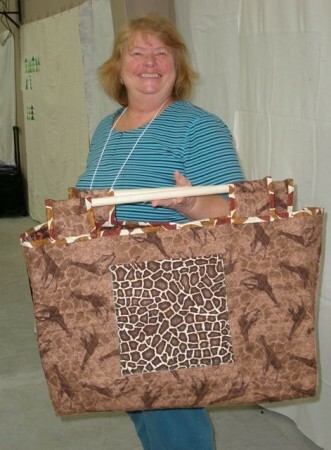 Diana is ready for Halloween! 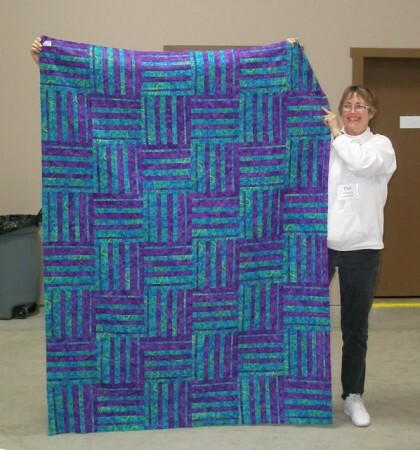 She got this pieced at retreat. 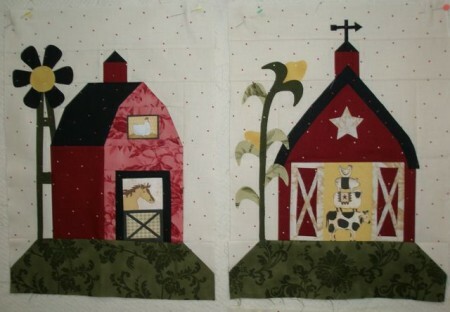 Love the needlework and shading in this piece. 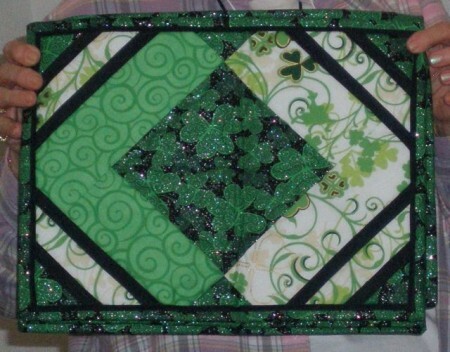 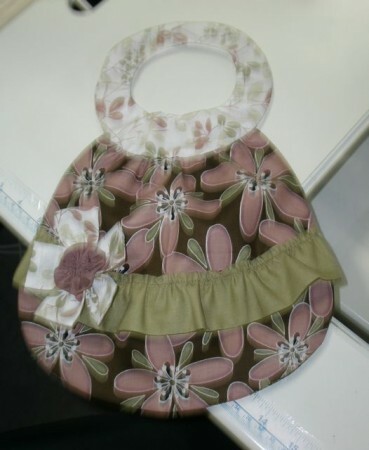 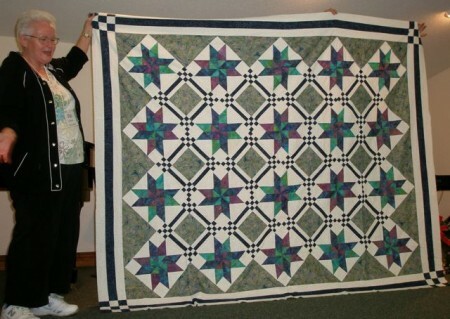 …and Dianna whipped out this little sampler with two 12″ and three 4″ Lemoyne stars. 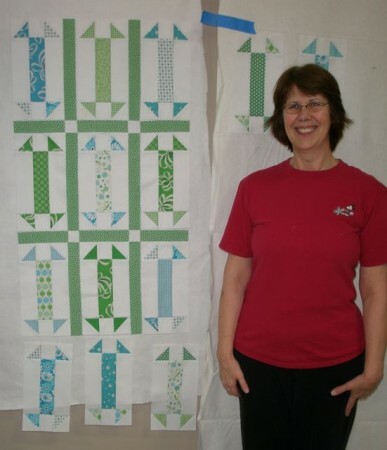 It’s really that easy–and no set in seams! 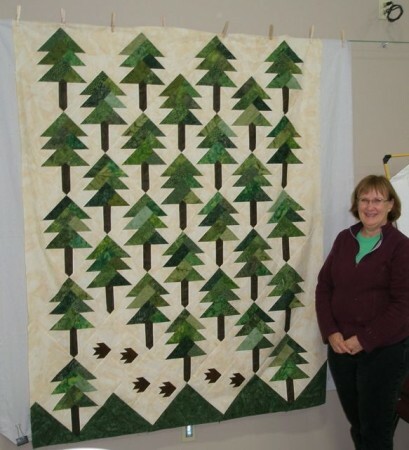 Julie made this pretty log cabin. 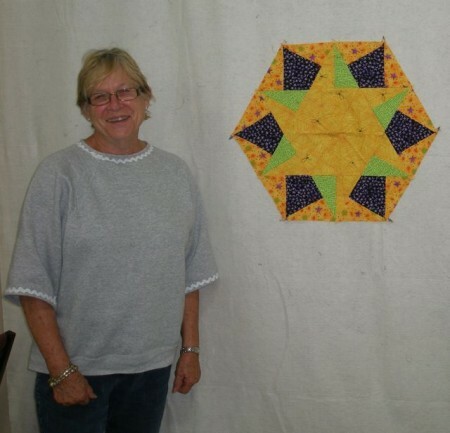 Pat P2 wore a jacket that she made with batik blocks. 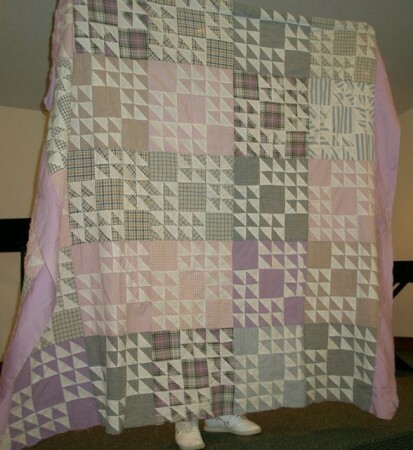 I don’t know which came first, this quilt or the jacket! 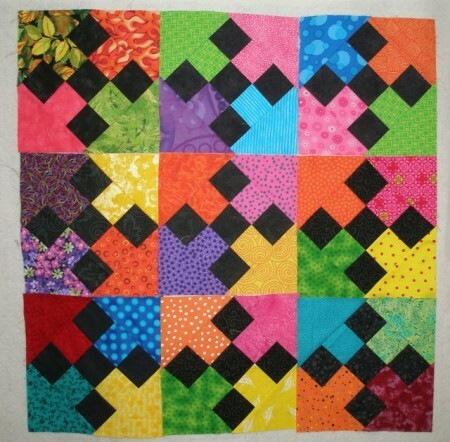 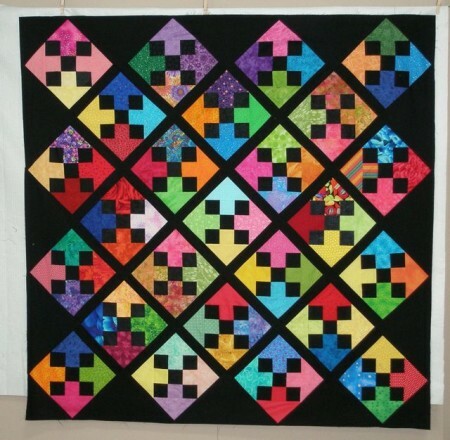 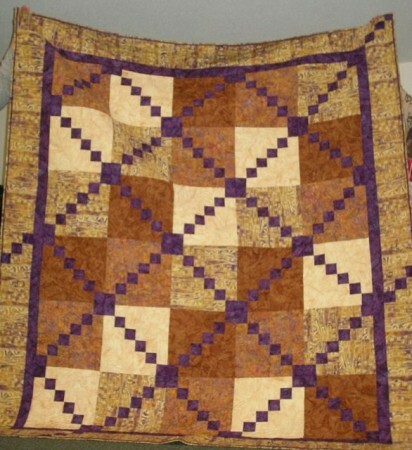 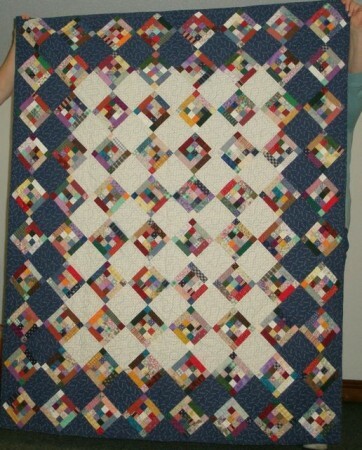 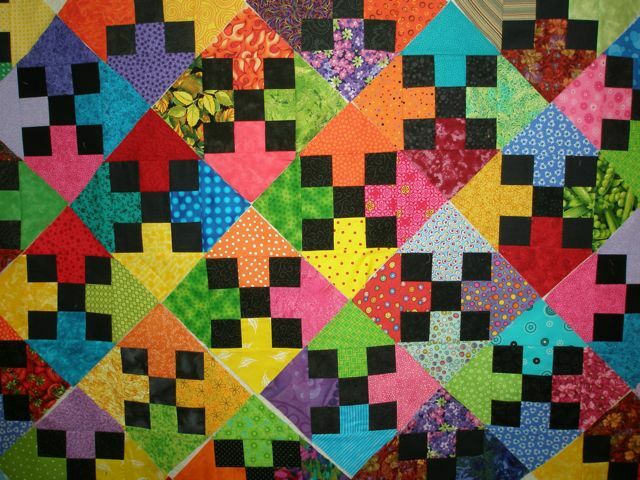 Don’t you love the color combination in this Chain quilt? 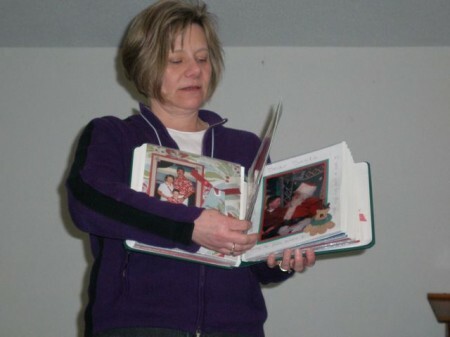 More great show-and-tell. 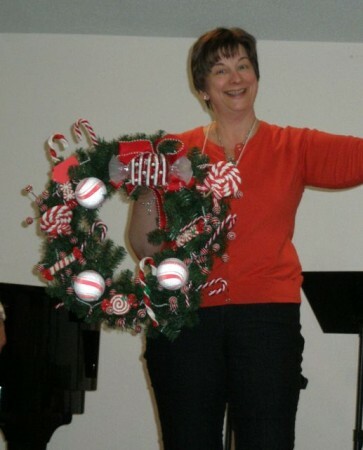 This is Patti’s Double Wedding Ring. 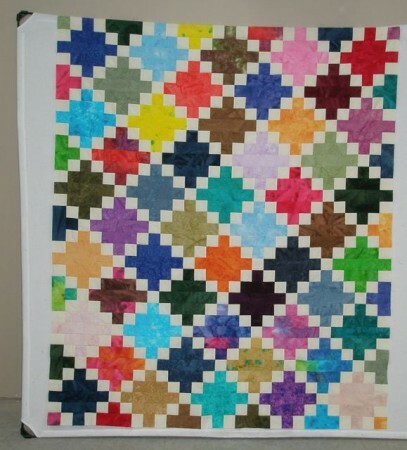 This Colorwash Cross was her project at the last retreat. 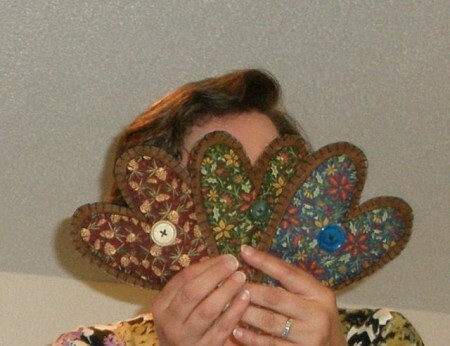 This time she was working with these great batiks. 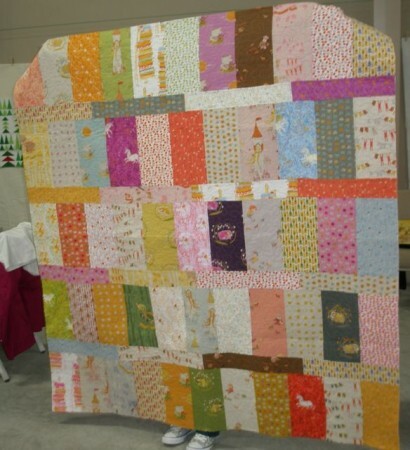 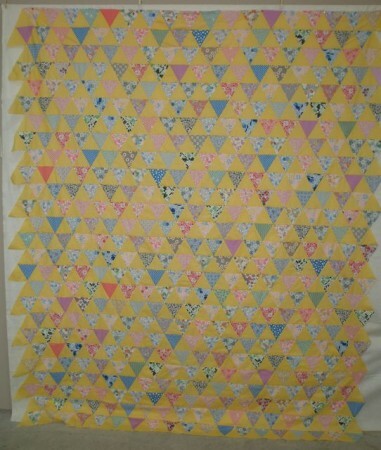 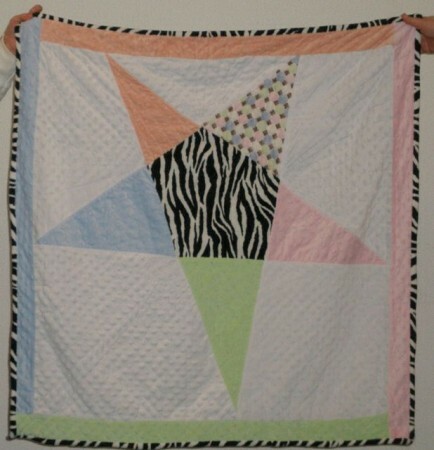 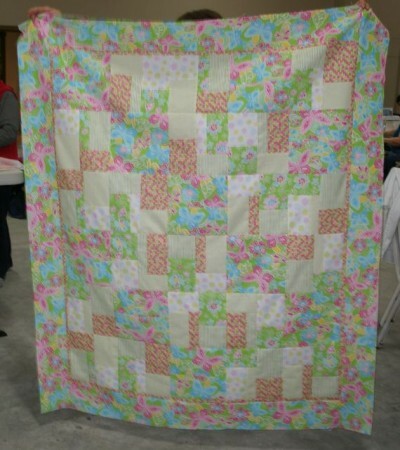 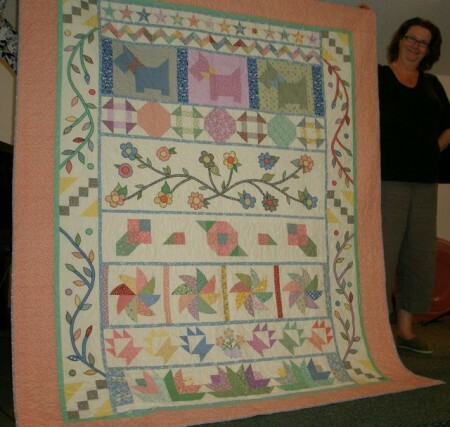 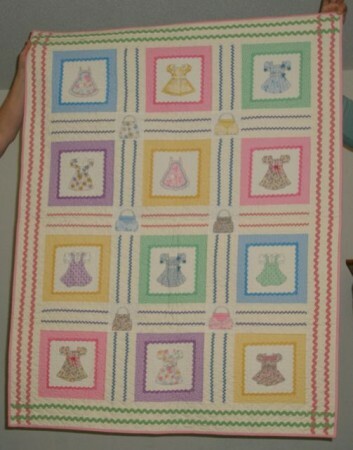 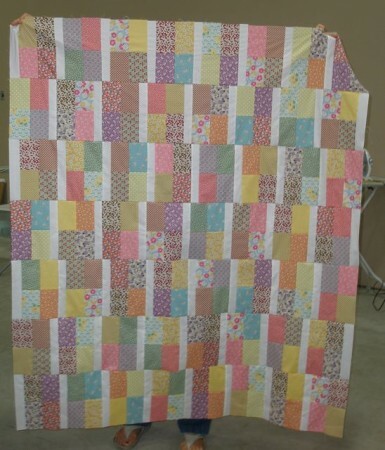 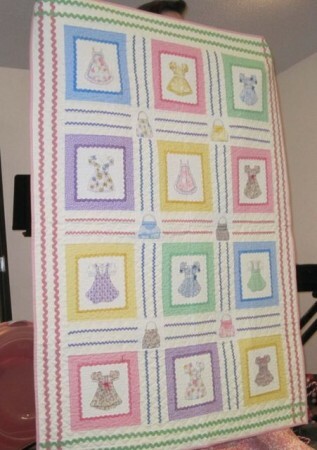 Marsha was making a pretty pastel quilt for her granddaughter’s big girl bed! 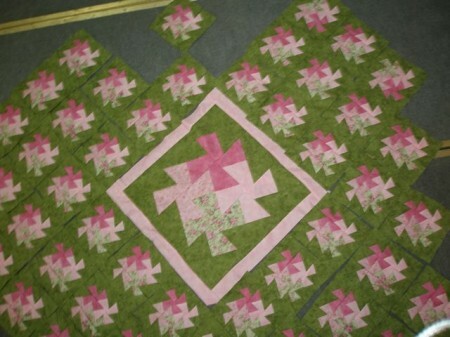 Rosemarie had several Hmong embroideries that she had finished. 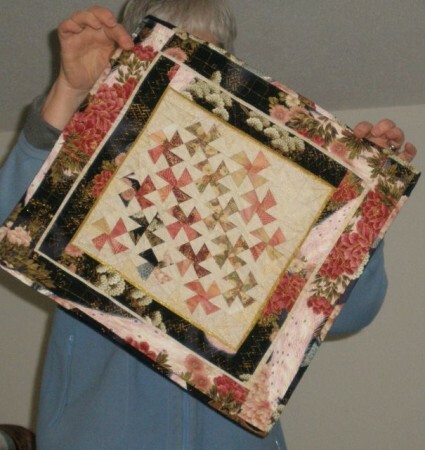 She did a lot of embellishment on this one. 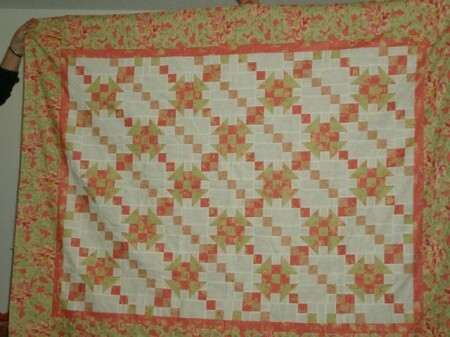 This pretty quilt is hers, too. 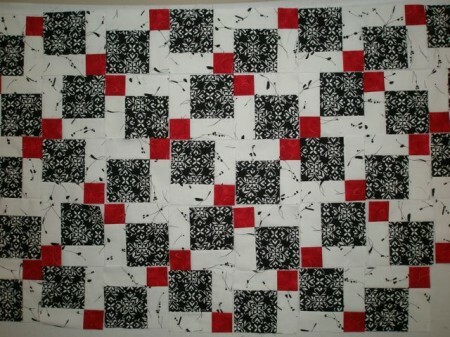 As is this black, white and red one. 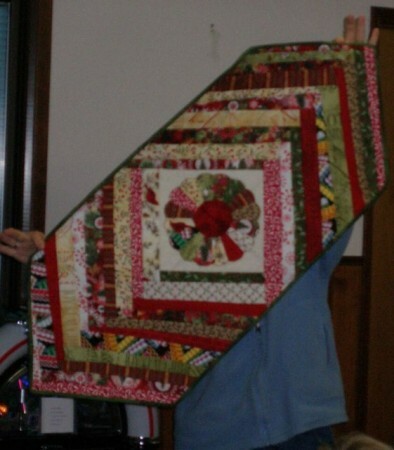 Annie was duly proud of this quilt. 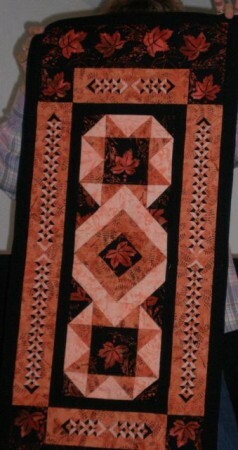 Here’s the back. 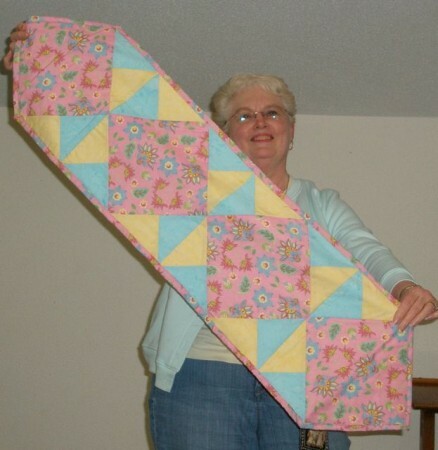 She did a quilt-as-you-go technique. 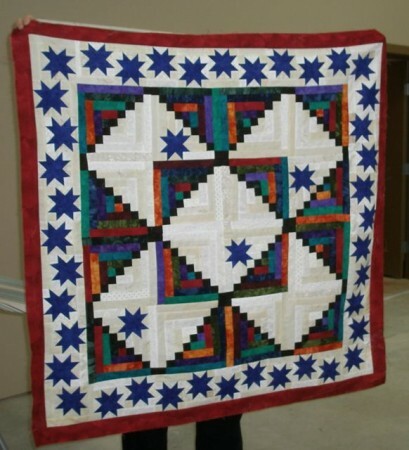 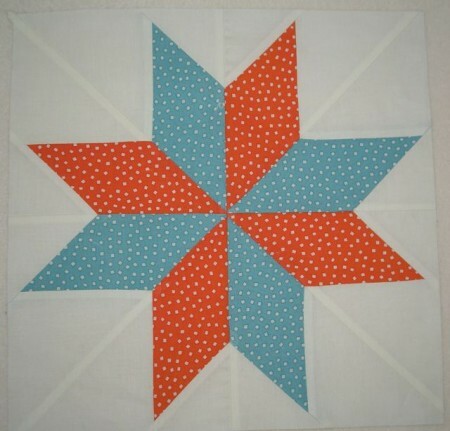 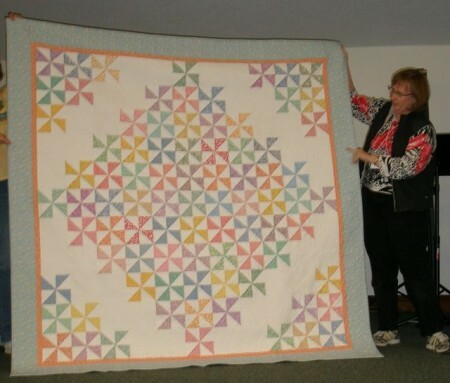 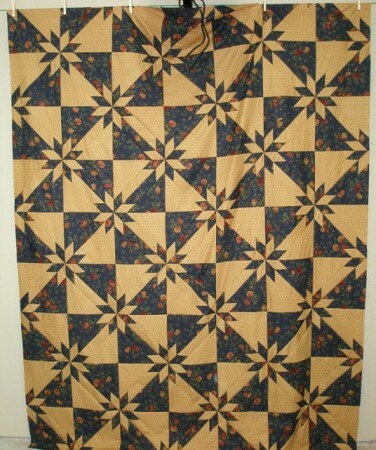 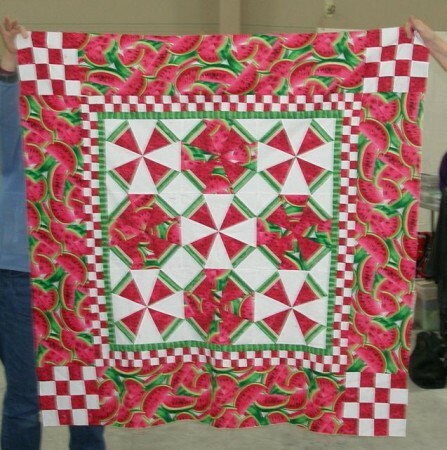 During the retreat she was working on this Friendship Star with a Twisted Ribbon border. 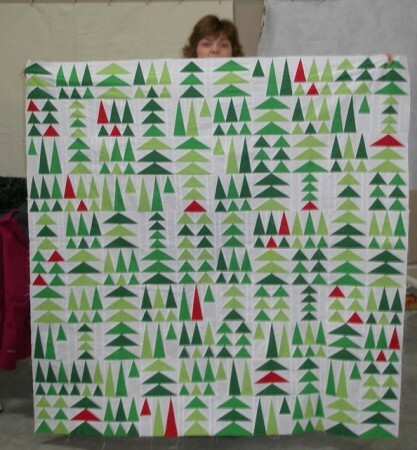 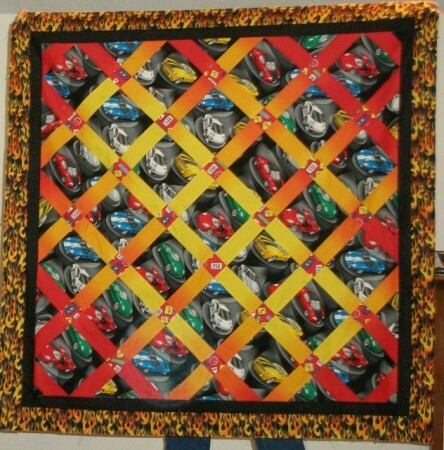 And this was the second car quilt she had on the design wall! 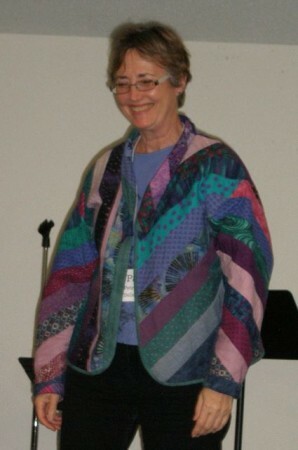 Pat T. (not to be confused with Patti or the other three Pats that were there!) 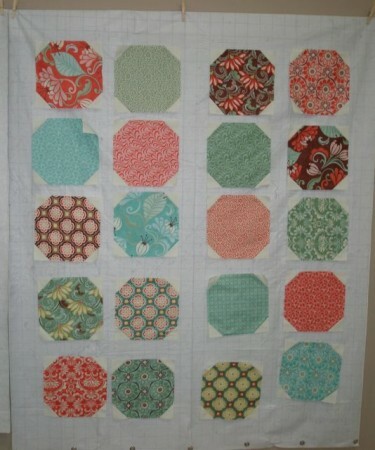 made this sampler from shop hop blocks. 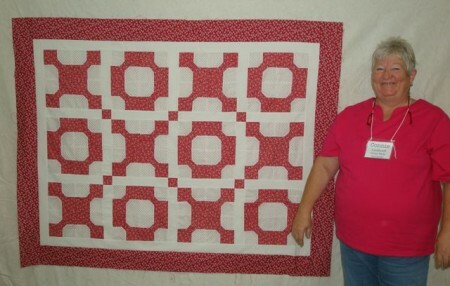 She also made two pillow covers to match. 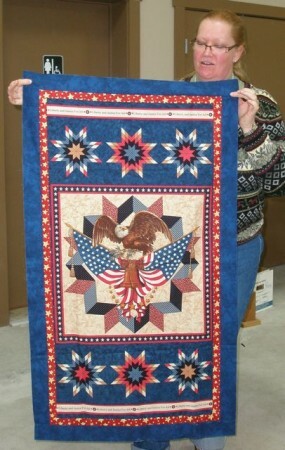 I love the sweet embroidery in the center of this one. 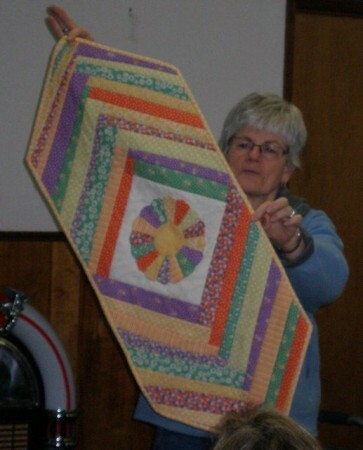 For show-and-tell she brought her Crossroads quilt. 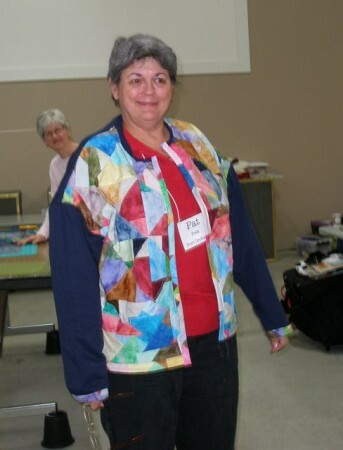 She also got this top put together during the retreat. 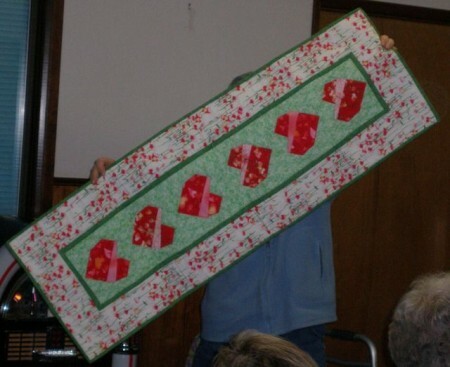 I believe this train pillowcase is for her grandson, who has a basement full of trains. 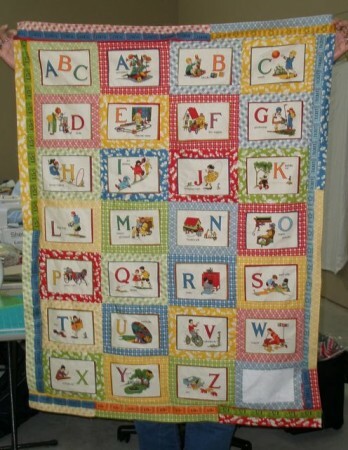 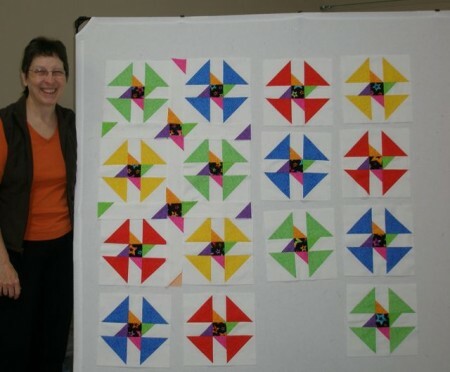 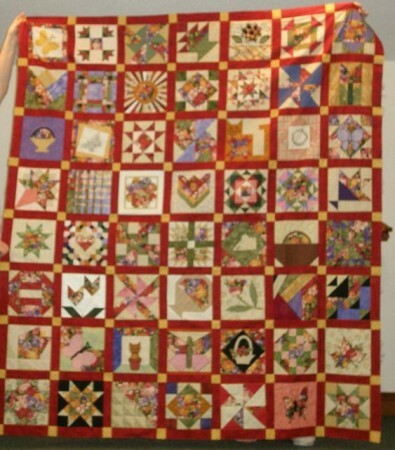 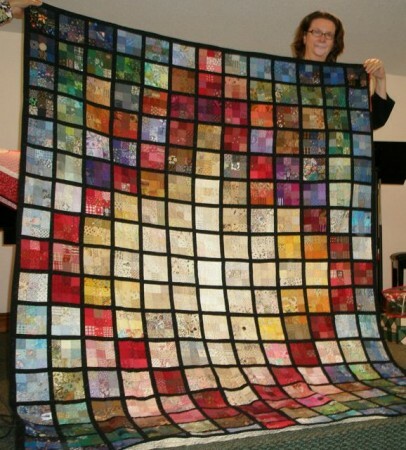 Sue brought a beautiful Twelve Step Program quilt from my book, Bundles of Fun. 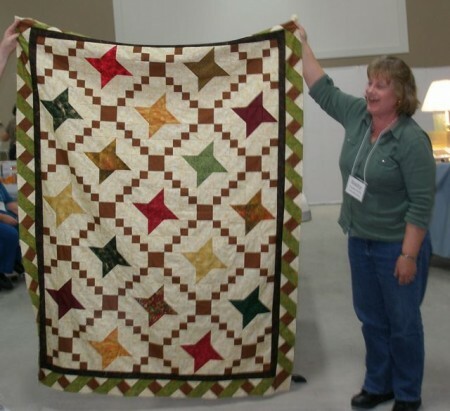 I think this is the most frequently made quilt from the book! 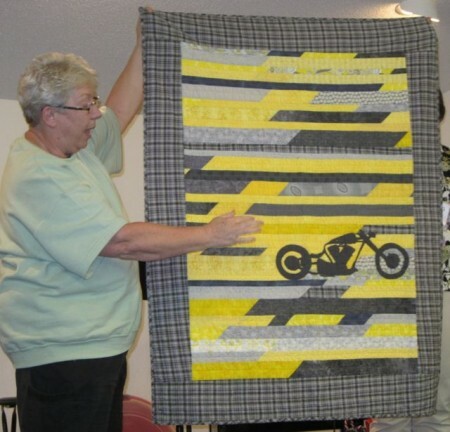 She also brought this Checkerboard quilt that she’d made, but I heard a rumor that someone else tried to claim it, perhaps two someones! 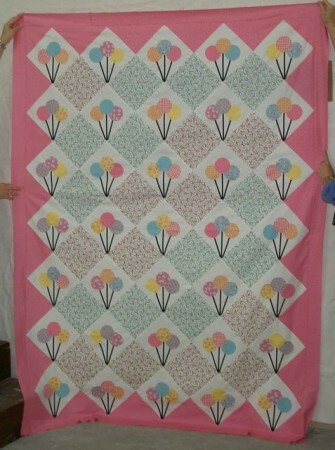 Isn’t this soft and pretty. 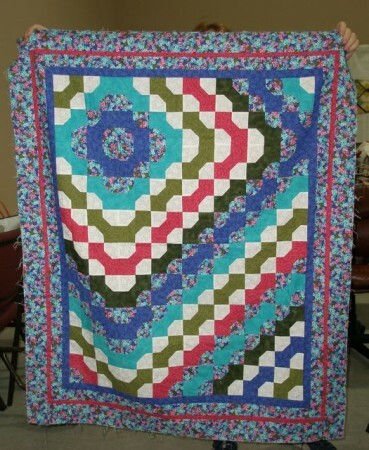 I don’t know the pattern name, but it’s lovely! 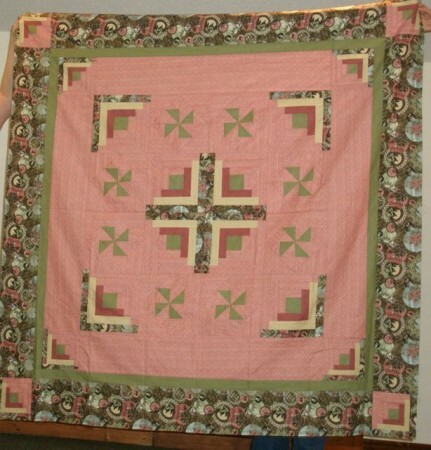 Sue’s niece is going off to college, and Sue is making a quilt for her in her favorite colors–pink and orange. 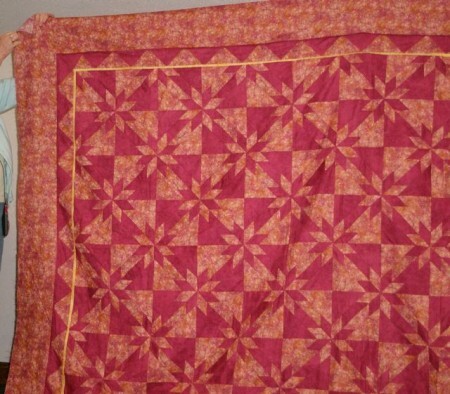 I have to tell you, in high school, my bedroom was pink and orange. 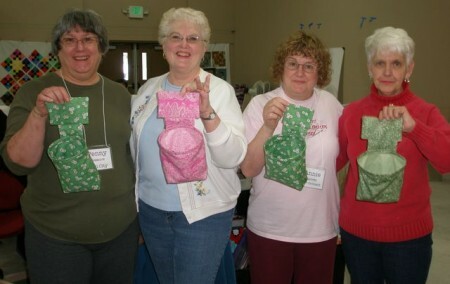 I’m so old, it’s popular again!